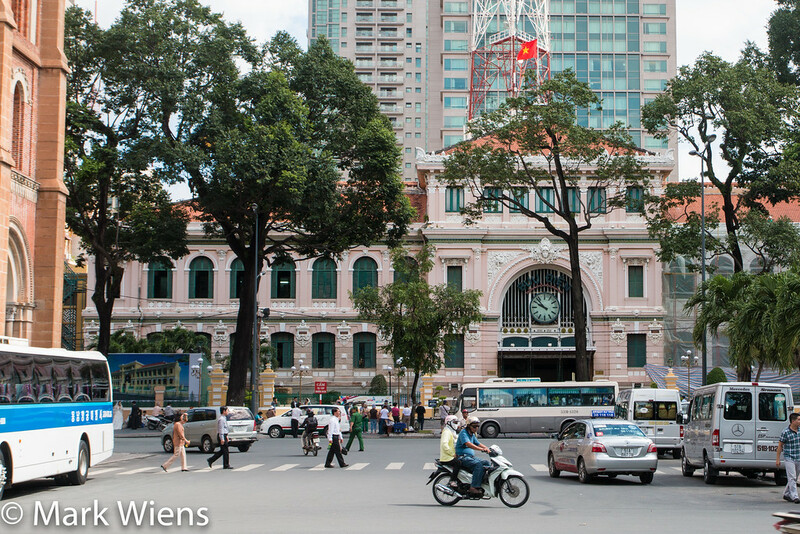 Ho Chi Minh City (known better as Saigon) is packed with attractions! 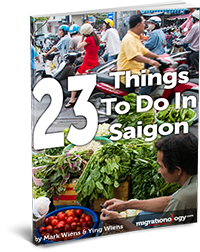 Exclusive Offer: I made “23 Things To Do in Saigon” into an eBook in PDF format that you can download for FREE (the eBook is easier to read and even print). Enter your name and e-mail below to download your free PDF copy of my Saigon travel guide. 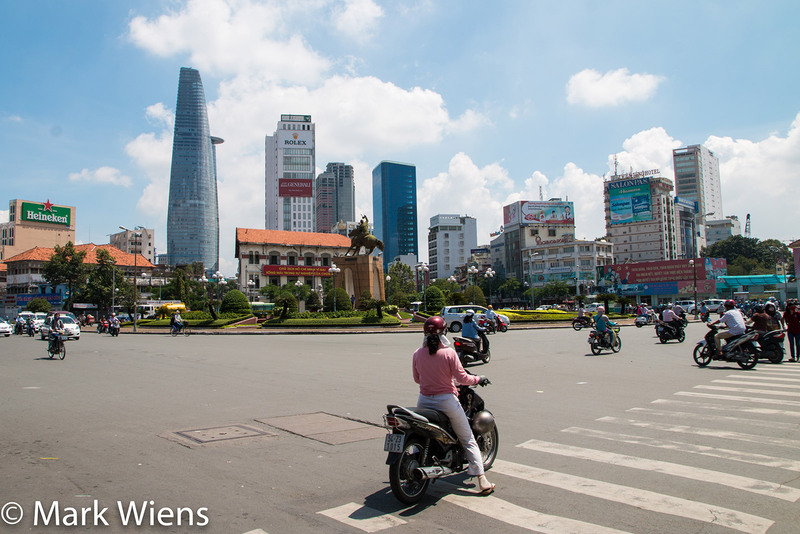 Saigon (also officially known as Ho Chi Minh City or locally in Vietnamese as Sài Gòn) is Vietnam’s most booming up and coming city, a places where the action never stops. In this post I’m going to go over 23 of what I think are the top things you can do and see when you’re in Saigon. Get ready to dodge motorbikes, navigate through market alleys, inhale some incense smoke at temples, and squat on the sidewalk while slurping down bowls of hot noodles. First, where is the best place to stay when you’re in Ho Chi Minh City? Many of the large 5 star hotels are located in the Dong Khoi area of Ho Chi Minh City – it’s known as being one of the most prestigious areas of the city. You’ll find hotels like the classic Hotel Majestic Saigon and the famous Continental Hotel Saigon, located adjacent to the Opera House. If you’re looking to stay in a fancy five star hotel, surrounded by French colonial architecture and lush cafes, Dong Khoi is one of the best areas to base yourself during your stay. Sort of like Bangkok’s Khao San road, the area of Pham Ngu Lao, and also Bui Vien Street, is the most famous budget backpacker district of Ho Chi Minh City. There are dozens of hotels, guest houses, and hostels along these two streets, ranging from very budget to mid-range, and I even noticed a few (sort of out of place) higher end hotels on Bui Vien Street as well. Since this area is dominated by foreign backpackers and travelers, Pham Ngu Lao is also a big party nightlife area, and among the hostels are numerous bars, nightclubs, and massage parlors. If you want to be right in the thick of the energy of Ho Chi Minh City, with plenty of restaurants (many international restaurants) and nightlife options, and just a short walk from the famous Ben Thanh Market, Pham Ngu Lao is a good area to look for accommodation. Just a short walk across the park from Pham Ngu Lao is the most well known central area of Ho Chi Minh City, the area that surrounds the landmark Ben Thanh Market. There are plenty of hotel options in the streets surrounding the market, and this is the area where many tour groups stay. Many of the hotels around Ben Thanh Market are mid range to upper level, but the location is extremely central and there are plenty of attractions and things to do in the area. I’d say the Ben Thanh Market area is one of the best places to base yourself. I stayed on Pham Ngu Lao for a few days, but then I transferred to LeBlanc Saigon Hotel, a family run guest house in a local friendly neighborhood just north of Tao Dan Park. It’s out of the main touristy area, so it’s more of a local experience, but the hotel is very nice, family run, and the Vietnamese food in the area is fantastic. I would highly recommend it. You may read some stories of theft and snatching in Ho Chi Minh City. And just like any fast and busy city, there’s always going to be a risk of carrying belongings with you. 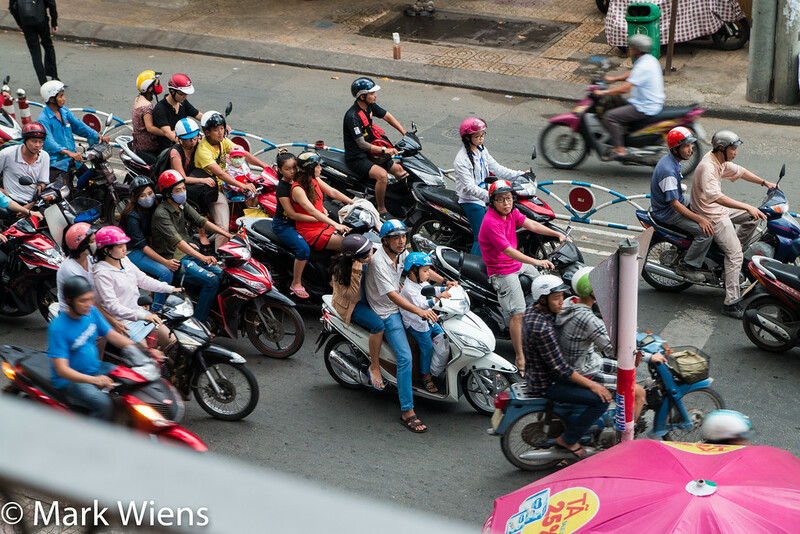 One of the main safety concerns in Ho Chi Minh City are thieves swiftly swinging by on motorbikes and grabbing bags or mobile phones or cameras, right out of your hand. Phone – Never pull out and use your mobile phone facing or open to the busy street. When I busted out my phone I usually went to the side of the street, and tried to duck into a business patio and sheltered myself with the wall. Camera – Likewise with a camera, you sort of have to use your own discretion of when and when not to be holding your camera out in the open to take photos. Again, try to have your back against a wall or stand to the back of parked motorbikes when you take photos of the open roads to provide a bit of a bunker. Wallet – I typically like to keep my wallet in my front right pocket, and then I like to keep some small money in my left pocket. When I buy something small on the streets, I just reach into my left pocket to pay, rather then having to take out my entire wallet. Use whatever system works best for you, but it’s a good idea to have some small money to buy small things, where you don’t have to take out your full wallet. Touristy areas – The majority of muggings happen in touristy shopping areas, so use extremely caution with your valuables in these areas. However, just to reassure you, many of the people in Saigon are extremely friendly and very kind. When I was eating street food and walking around Saigon, I was greeted by dozens of friendly people. So don’t be too uptight, enjoy and experience as much as you can, but do take some precautions as mentioned above. Just like in Bangkok, there are many different methods of getting around Saigon, and you may have to take a couple of methods to get somewhere you want to go. Though I’ve heard a rail or subway system may be in the plan, as of now, it’s all ground transportation in Saigon. If you fly into Saigon, you’ll arrive at Tân Sơn Nhất International Airport. From there, the easiest way to get to your hotel is probably to take a taxi. Walk outside of the airport, take a left, and you’ll see the taxis waiting for you. Vinasun is a good brand to choose. It cost me a little under 160,000 VND to get from the airport to the Pham Ngu Lao area. 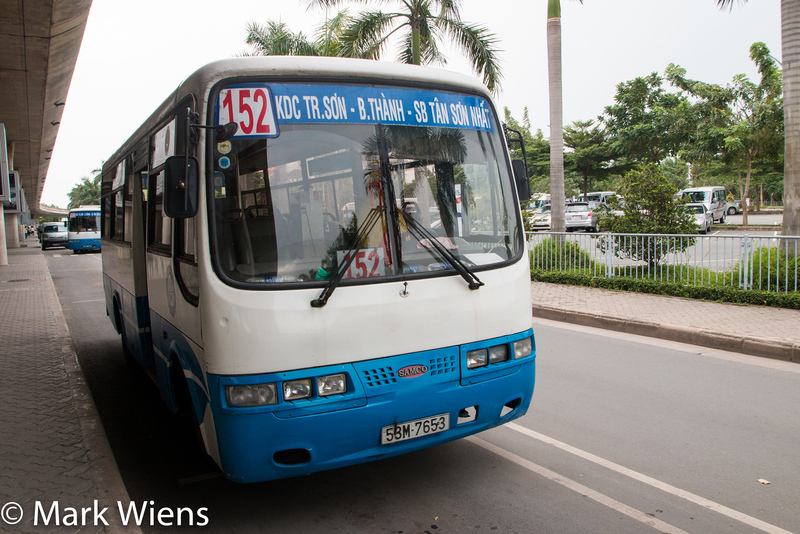 You can also take the bus, which costs just 5,000 VND (pictured above). Walk out of the airport, cross the street, and look for bus #152. The bus will take you all the way to Ben Thanh Market. With motorbikes that control the streets and even sidewalks, Saigon is not quite as pleasant as a city for walking as somewhere like Tokyo. But that being said, I like to think of walking in Saigon as sort of like an obstacle course; You’ve got to dodge oncoming objects, jump over blockades, go around sprawling businesses, and cross the rivers of motorbike traffic. For most of my time in Saigon, especially in the central areas of town, my wife and I walked everywhere (but we are kind of crazy for walking, we like to walk so we can eat more). 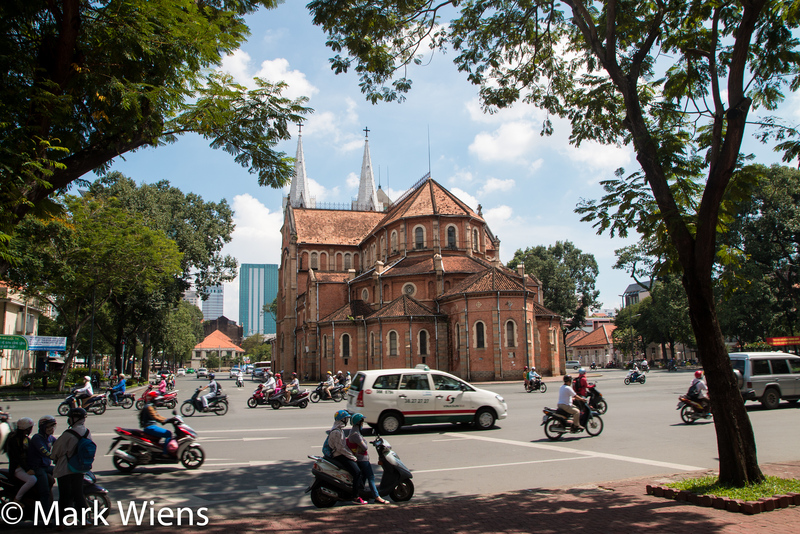 Some of the central and most famous things to do in Ho Chi Minh City are located within walking distance, if you can handle the traffic and heat (and traffic fumes). I think walking is one the best ways to explore any city, and you can stop whenever you like, and find delicious food along your route. By far the most noticeable way everyone that lives in Ho Chi Minh City gets around is by motorbike (also known as the scooter). Saigon may very well be the scooter capital of the world. There’s an astounding quantity of scooters in the city. Rent a motorbike – If you have the confidence to rent and drive a motorbike yourself, there are plenty of rentals agencies, especially located in the Pham Ngu Lao area. You’ll probably pay around $10 per day. 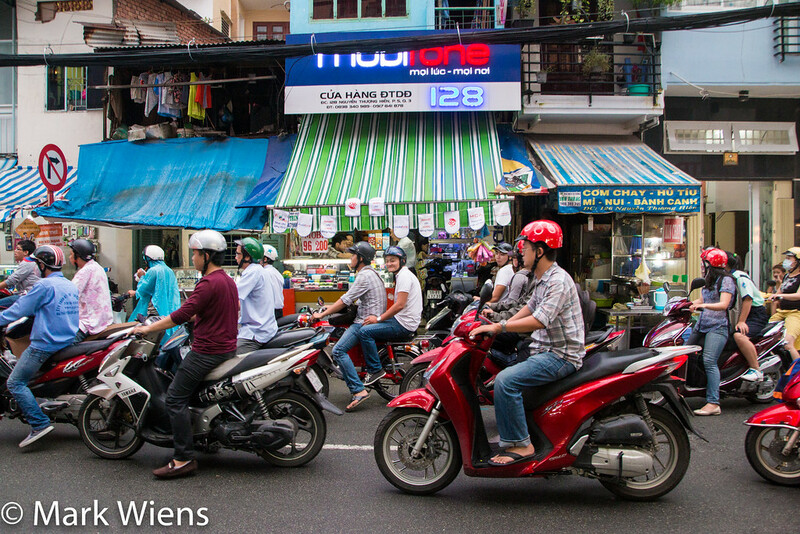 Motorbike taxi – On just about every corner of every street in Saigon, you’ll see men reclining on their motorbikes, sometimes sleeping, sometimes just gazing into the traffic and patiently waiting. These men are motorbike taxi drivers. For a price, they will take you anywhere in the city you want to go, small journeys usually start around 20,000 – 40,000 VND. The bus system in Saigon is actually quite good (and not too difficult to figure out if you just go up and down some of the main streets), and it’s a very cheap and safe way to get around town. There’s a color coded map, and though it’s kind of blurry to see all the numbers and city bus routes, it does help to plan a bus route to somewhere you’d like to go. My wife and I took the bus in Saigon many times during our stay, and some buses cost 5,000 VND and others were 6,000 VND per ride. The biggest challenge of taking the bus in Saigon is figuring out all the one-way streets, but just study the bus map a bit, and you can easily take it at least up and down the main streets. Before you go to Ho Chi Minh City, you’ll probably read some articles about how bad the taxis are. Yes, there can be fakes, and drivers occasionally do some extra driving to rack up the meter. But on a whole, I thought the taxis were quite reliable, and even many of the drivers were quite friendly. 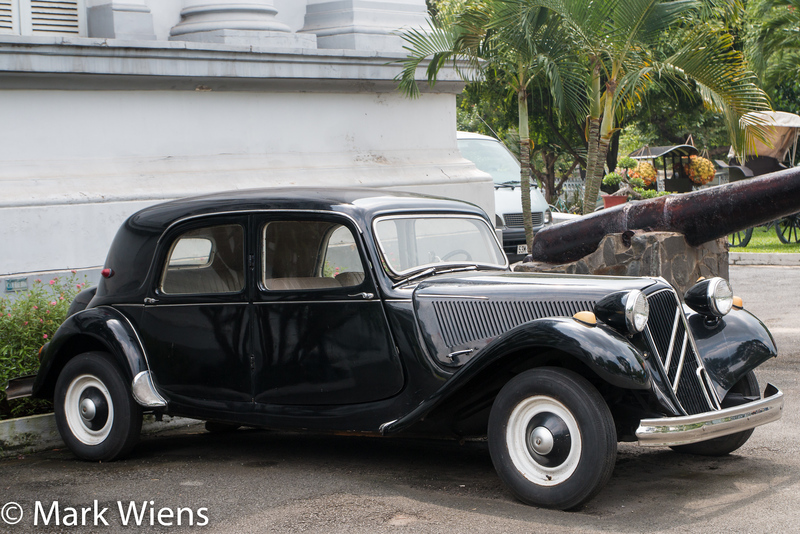 We hardly had a problem with taking any taxis when we were in Saigon, and they are very affordable, and I really like how they are almost all comfortable vans. However, when you take a taxi in Saigon make sure you take a reliable company and pay attention to confirm the taxi is an authentic brand. Also I like to keep my phone GPS with the map open so I can follow where the taxi is going to make sure we’re on track. 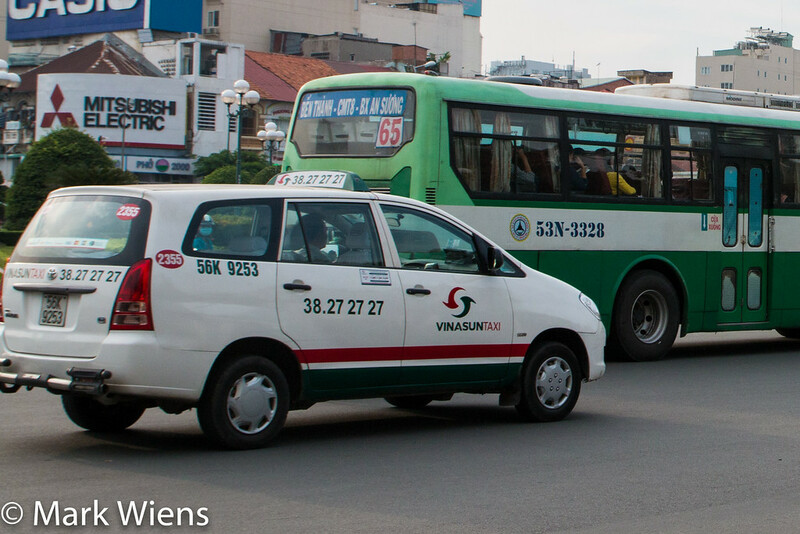 Vinasun – Vinasun is one of the most reliable taxi companies in Ho Chi Minh City, and they are also one of the largest. You’ll see Vinasun taxis, with their green and red stripe, everywhere you go in the city. Just make sure the logo is correct and make sure the phone number (38 27 27 27 – written on the side of the taxi) is correct as well. Mai Linh – Mai Linh is the other big taxi company in Ho Chi Minh City. Honestly though, I probably took Vinasun 90% of the time. Uber – Uber, the private cab service, is available in Ho Chi Minh City, and it’s beginning to take off. Once you download the application, you locate an Uber, and payment is handled all online, so you never have to touch cash. We used Uber quite a bit, and it’s almost the same price, if not a bit cheaper than normal taxis (at the time of writing this, things could change). Alright, now that you know where to stay in Saigon and how to get around, let’s jump right into these 23 things to do when you’re in Saigon (Ho Chi Minh City). Welcome to Binh Tay Market! You’re going to hear most about Ben Thanh Market. But I actually found Binh Tay Market to have better prices, be a more local experience, and I overall enjoyed visiting it more than Ben Thanh. 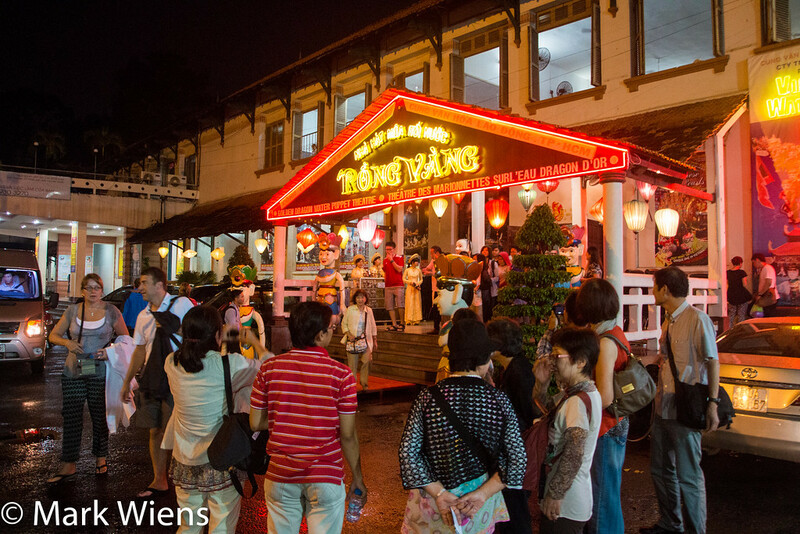 Binh Tay Market is one of the major official markets, located in the Cholon area of Ho Chi Minh City, what is Chinatown. It has a similar feel to it as Ben Thanh, and even many of the products that are sold – from clothes to food – are basically quite similar. 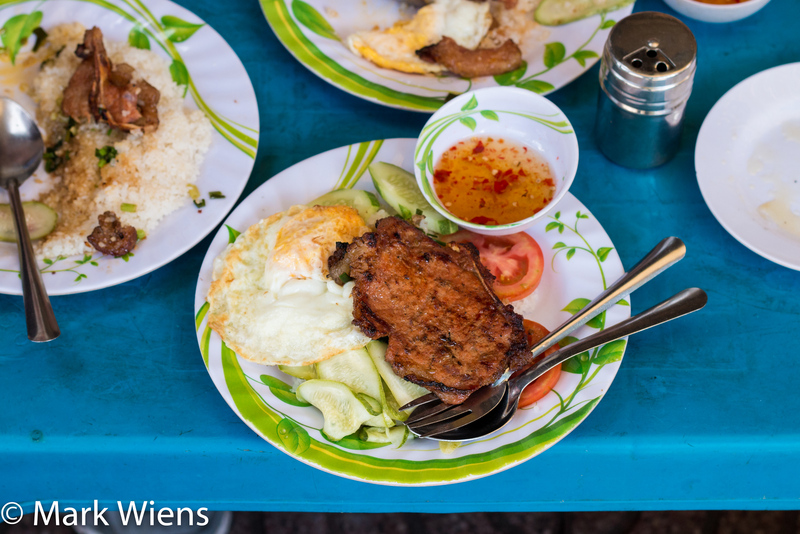 However, from what I noticed in my few visit to both markets, Binh Tay Market caters a bit more to local Vietnamese, and therefore the prices are lower, and overall a little less touristy geared. Before going to Binh Tay Market, I had read about it from Eating Asia that, there was a wet market in the morning behind the market. This back lane fresh food market, was probably my favorite part of visiting Binh Tay Market, and one of the top places I would recommend seeing in Saigon. I had a plate of noodles fried with beef (mì gói xào bò), and sitting on a stool in the morning while eating and drinking coffee, I was extremely happy. 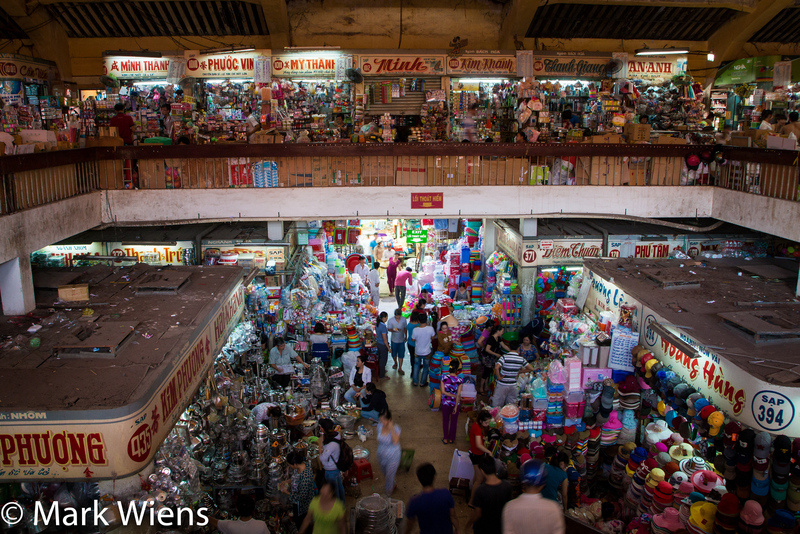 If you are looking to do some shopping when you’re in Ho Chi Minh City, at Binh Tay Market you’ll find just about everything made or produced in Vietnam from clothes to snacks. There’s a huge section of Vietnamese cooking utensils, nuts, spices, and tools. How to get there: The market is located in District 5, and it’s easiest to just jump in a taxi to get there. From Ben Thanh Market it cost me 110,00 VND, and the ride took about 15 minutes. From the outside, the pagoda honestly didn’t look amazing. Enter your email and I'll send you the best travel food content. The entrance wall face was well weathered, rather unmaintained (but this did also give it an ancient feel), and it had almost a haunted feeling to look at. However, as soon as you step inside, the beauty of the temple, mostly through the intricate details and carvings, is revealed. 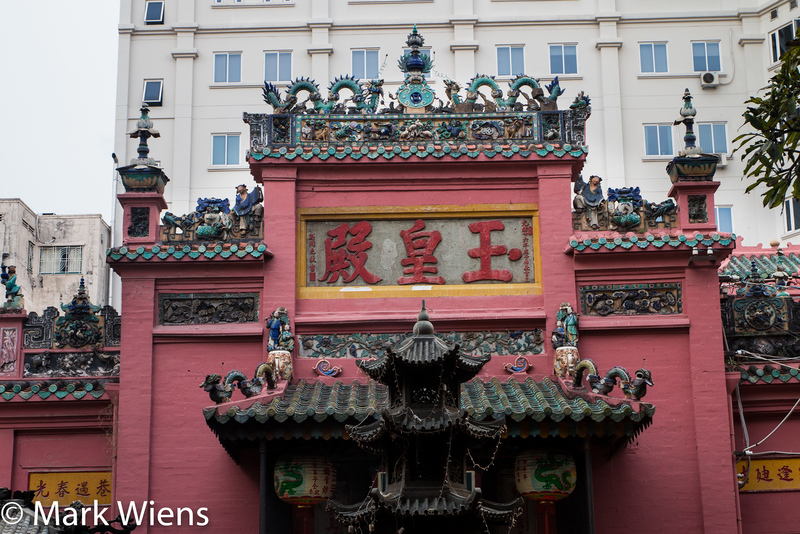 One of my favorite parts of going to Thien Hau Pagoda in Saigon were the incredible sculpture reliefs carved on the upper roof section of the temple, depicting scenes of daily life. They were colorful, but weathered, and had accumulated years and years of incense smoke, making the sculptures look ancient and dusted in black soot. 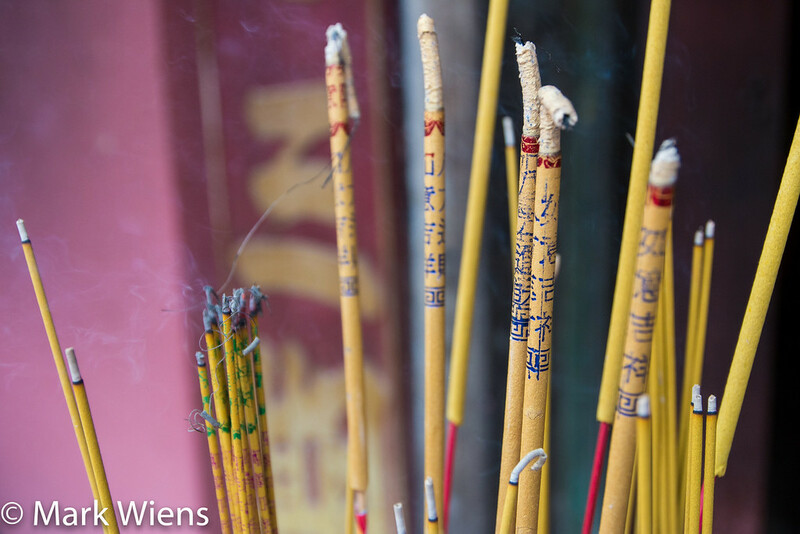 Another highlight were the giant coils of incense that burn slowly, hanging from the ceiling, and filling the temple and atmosphere with smoke. Ho Chi Minh City has a very strong Chinese presence, and when you’re at Thien Hau Pagoda you’ll feel like you’re actually in China. The pagoda is well worth visiting when you’re in Cholon (Saigon’s Chinatown). 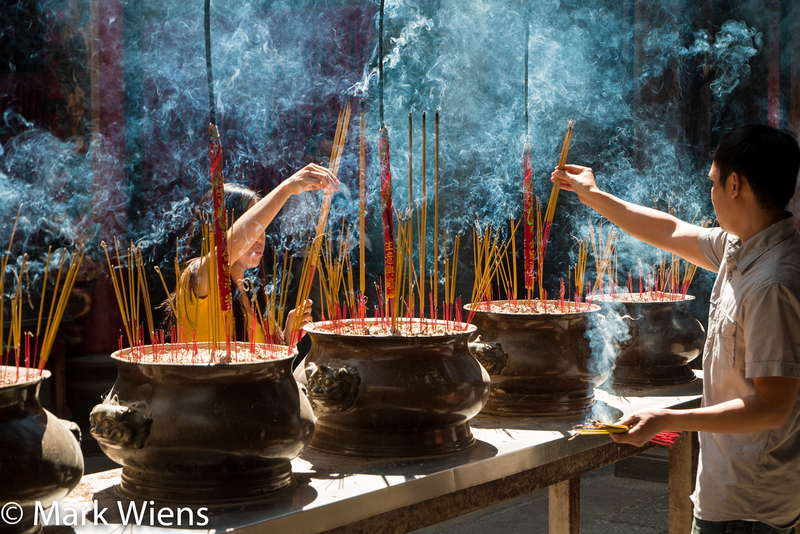 How to get there: The temple is located in Cholon, District 5. It’s easiest to get there by taxi. When my wife and I visited, on a weekday in the middle of the morning, it wasn’t busy at all (unlike the War Remnants Museum which was packed out), so it was nice to peacefully walk around and enjoy the exhibitions. Most of the displays show the history and making of Ho Chi Minh City, and also there are a number of Vietnamese culture exhibits as well. But what I liked best, was just the amazing mansion palace that the Ho Chi Minh City Museum was housed in, yet another beautiful neoclassical structure built in 1885, with big pillars and wooden staircases. This museum, I thought, was a little old and sleepy, but for just 15,000 VND for entrance price, I thought it was still worth having a quick browse. 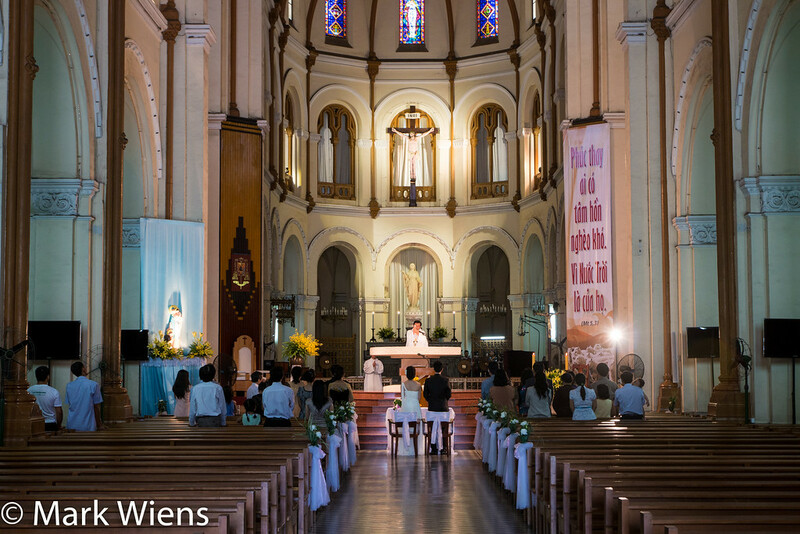 How to get there: The HCMC Museum is located near the Dong Khoi area of the city, walking distance from the Cathedral of Notre Dame. From a distance, or from the sky, it’s easily the most recognizable building in Ho Chi Minh City, for its tallness and for its modern design. 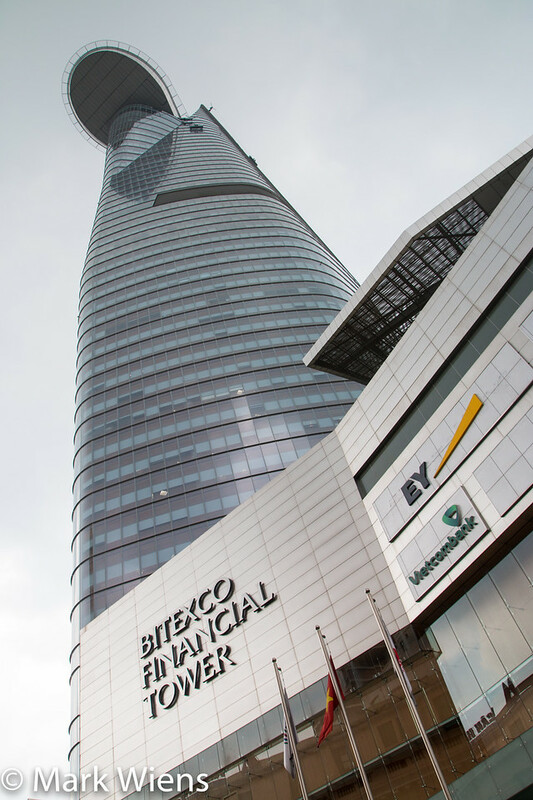 There are a number of things you can do when you’re at the Bitexco Financial Tower, but by far the most popular attraction is to take advantage of the height of the building to get a view of the city. The bottom floor of the tower is a small shopping center, with a few cafes, but there’s not really much else. The majority of the building is occupied by offices. There are two choices for visiting Bitexco Financial Tower for a chance to see the amazing view of the city. 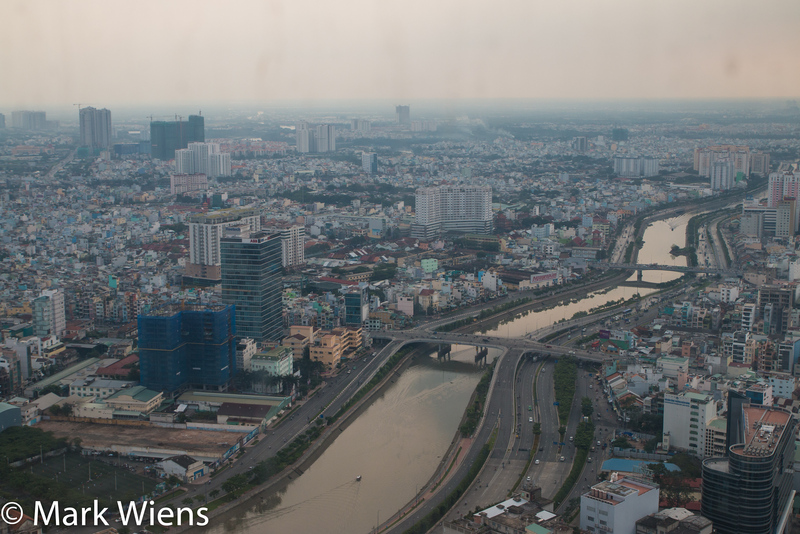 Saigon Skydeck – Located on the 49th floor, this observation deck offers a panoramic view of the city. This is sort of an official Ho Chi Minh City attraction, and after you pay the entrance, you are free to browse around the floor and enjoy the views. 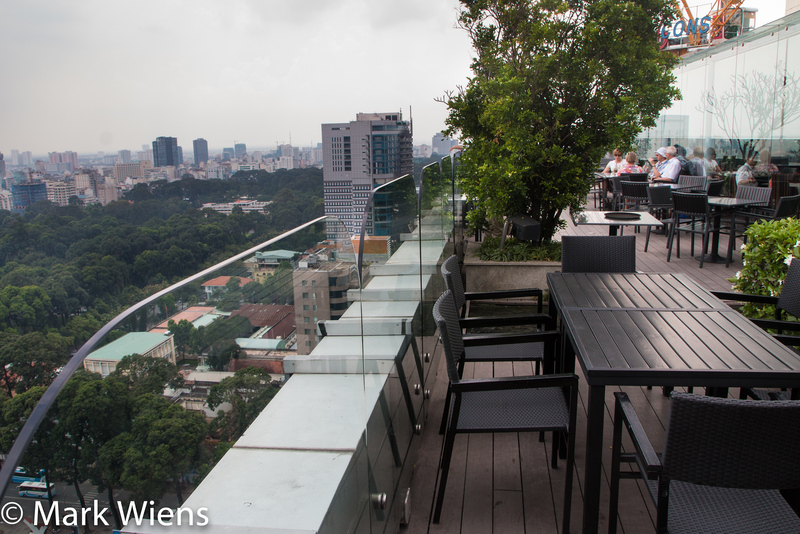 Eon Cafe – Located on the 50th floor, and not connected to the Saigon Skydeck, is Eon Cafe, a way overpriced cafe and bar where you can come at the expense of buying a drink. Since having a drink or food in hand will always sway my decisions, I decided to go to the cafe (instead of going to the Skydeck). The coffee was good, but extremely expensive, and the cafe looked kind of like a night-club. But nevertheless, I did enjoy the marvelous view of Saigon while sipping my coffee drip by drip. So I personally can’t speak for the Saigon Skydeck, but whichever place you choose, for sure you’ll have an incredible view of the city. Entrance price: 200,000 VND for Skydeck entrance. I went to the cafe and paid 130,000 VND for a tiny cup of ristretto – looked like about ¼ of a shot of coffee. How to get there: From the Ben Thanh Market area, you can walk to Bitexco Financial Tower, otherwise a quick taxi ride is a good option. 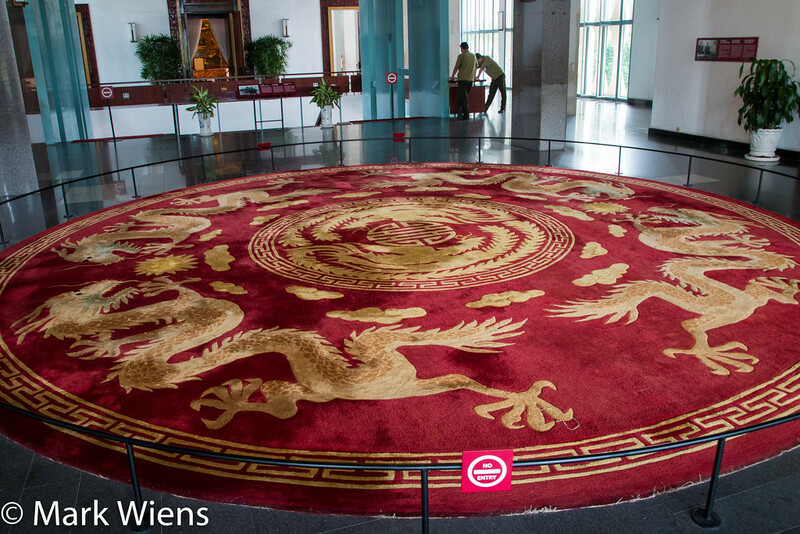 The round dragon carpet, located on the second floor, a huge circular red carpet with a dragon etched into the middle, was something I thought was pretty amazing. It was very interesting to visit the Independence Palace in Ho Chi Minh City, and I think the highlight for me was strolling through the dark and creepy basement. And also, the palace kitchen, still equipped with old school machines, was pretty cool. They still hold services on Sunday if you’re interested, but if you just go to visit on any other day, make sure you arrive either in the morning from 8 am – 11 am or in the afternoon from 3 pm – 6 pm. When I went, I arrived right and noon lunchtime, and the gates were locked; So make sure you plan to visit during open hours so you can get inside. The next day I returned to enter the cathedral. The cathedral is beautiful, with two 40 meter high towers, and a statue of the Virgin Mary in the front lawn area. Make sure you go to the very front on the road-side, so you can get a great photo of Virgin Mary with the cathedral in the background. Inside the cathedral you’ll see beautiful stained glass windows, the wooden pews, and classic plaid floor tiles. There happened to be a wedding taking place when we visited, a sight I’m sure is quite common. 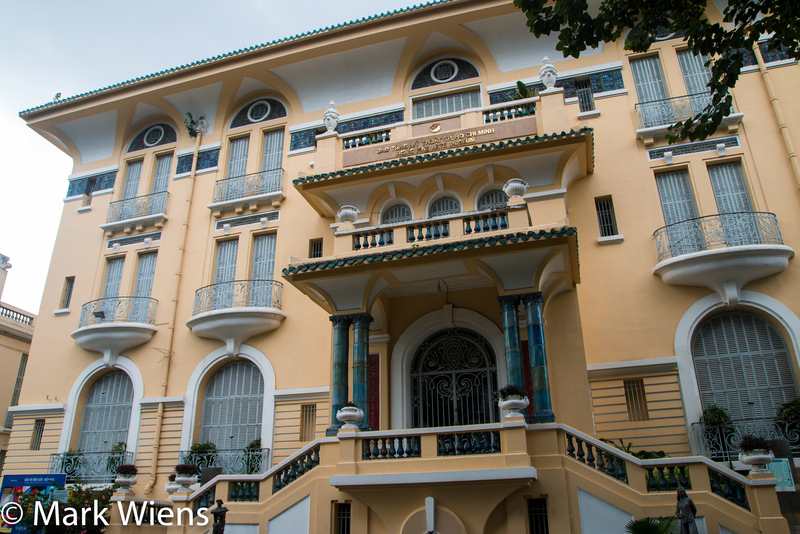 Again, just like quite a few other buildings in Saigon, it’s the French colonial architecture that really stands out. But even more so here, one of the top reasons the post office is one of the top Saigon attractions is because it was designed by Gustave Eiffel (yes, the man who also engineered the Eiffel Tower in Paris). 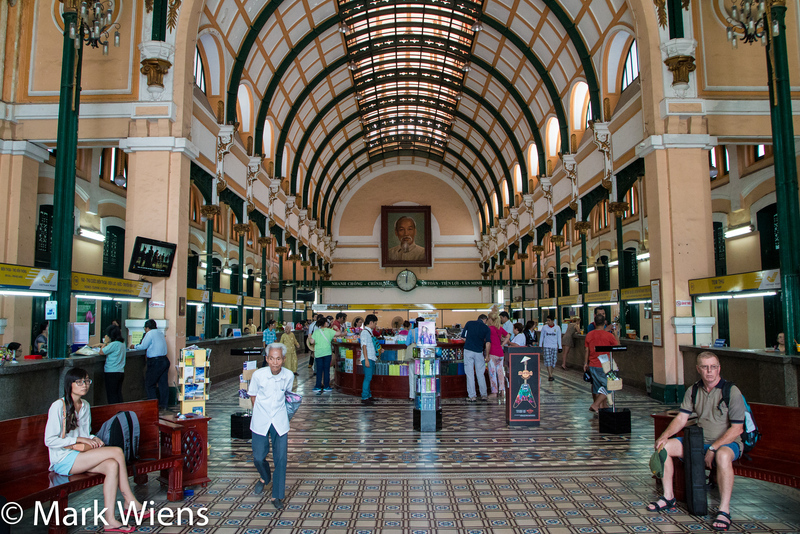 What I liked about the Central Post Office, was that not only has it become a top tourism attraction, but it also remains fully in use and functional. If you’d like, you can walk into the post office, buy a postcard from Vietnam, stamp it, and send it home to your friends and family right then and there. Also, I also really loved the floor tiling as well as the giant map murals painted on the walls. How to get there: Once you’re at the Cathedral of Notre Dame, the Central Post Office is right across the street. 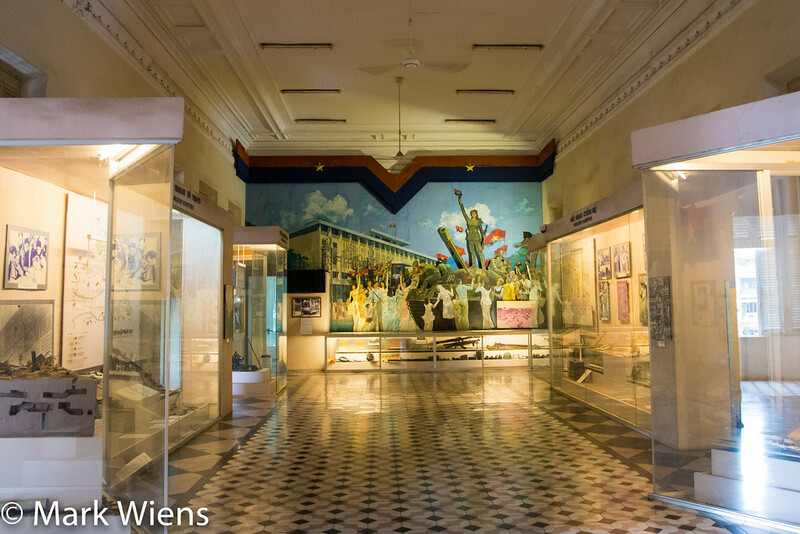 Most of the inside of the War Remnants Museum is filled with photography, shown in exhibitions, about various events of the Vietnam War. You are free to walk around the various photo and journalist displays. On the outside section of the War Remnants Museum is an equally sad life-sized model of a prison, where you’ll find replicas of prisoner rooms, stocks, and torturing devices for POW’s. If you visit the War Remnants Museum and you’re with kids, there is a playground room that I noticed where many young kids went to hang out while their parents walked through the museum (as you can imagine, it may not a great place for kids to see). Surrounding the museum, within the compound grounds are displays of previously used military weapons, tanks, and aircraft. 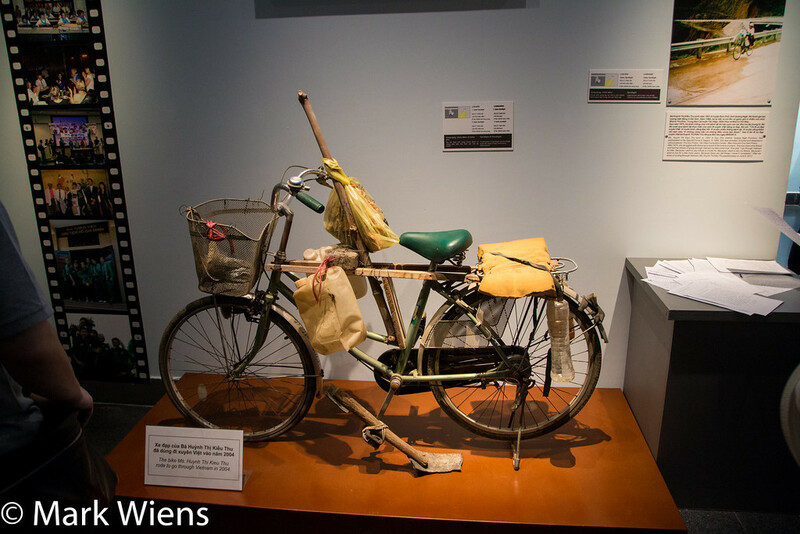 The War Remnants Museum is a worthwhile place to see in Saigon to learn, but again, be prepared for quite a heavy and saddening experience. How to get there: The War Remnants Museum is located just northwest of the Independence Palace, you can walk from there in about 10 minutes. If you are interested, the Opera House hosts A O Show, a performance of traditional Vietnamese dance using bamboo. I didn’t go to the show, but if you are interested in live performances, I’m sure it would be pretty cool to see – especially since it takes place in a such a glorious building. Open hours: Make sure you check the official site for show times and schedules and you can also buy tickets online as well. Dong Khoi street and area of Saigon, sort of reminds me of Oxford Street, it’s an upscale area of Saigon, and along Dong Khoi street you’ll find high end boutiques and designer stores. But along with upscale shopping, it’s just a nice place to walk around. Walking around Dong Khoi, I really felt like I was somewhere in between France and Vietnam, plus there’s a huge contrast of the old and new, modern and traditional. Along Dong Khoi street there are a couple of modern shopping malls like Vincon, and plenty of international and speciality stores. Also, many of the high end 5 star hotels, like the renowned Hotel Majestic Saigon are located in this area. 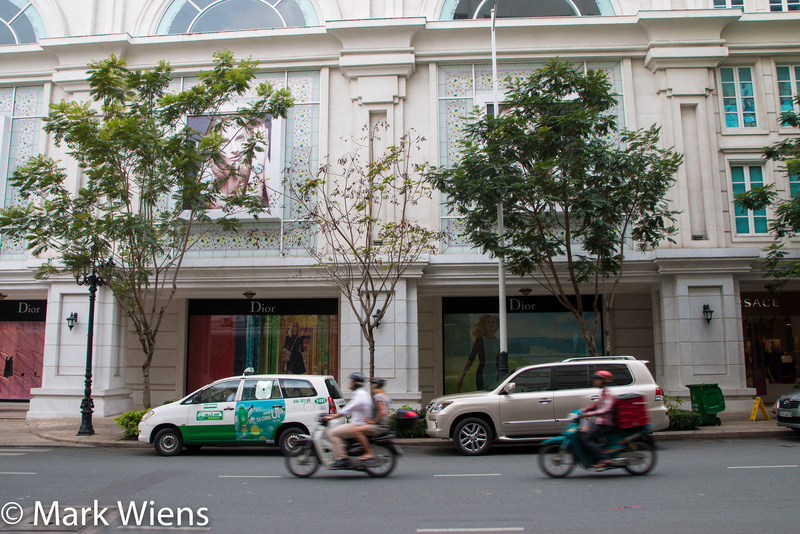 If you interested in doing some luxury shopping in Ho Chi Minh City, this is an area you’ll want to visit. Clustered together in the same park, is both the Saigon Zoo and the Botanical Gardens. Instead of having to pay for both attractions, you just pay a single entrance fee and you can then walk around both. The zoo, that is the animals part of the zoo, is not so great – the animals don’t look too happy, and the cages aren’t set up very well – it could definitely use a major renovation. However, the Saigon Zoo does host a range of animals from tigers (that really looked like they wanted to escape) to elephants. 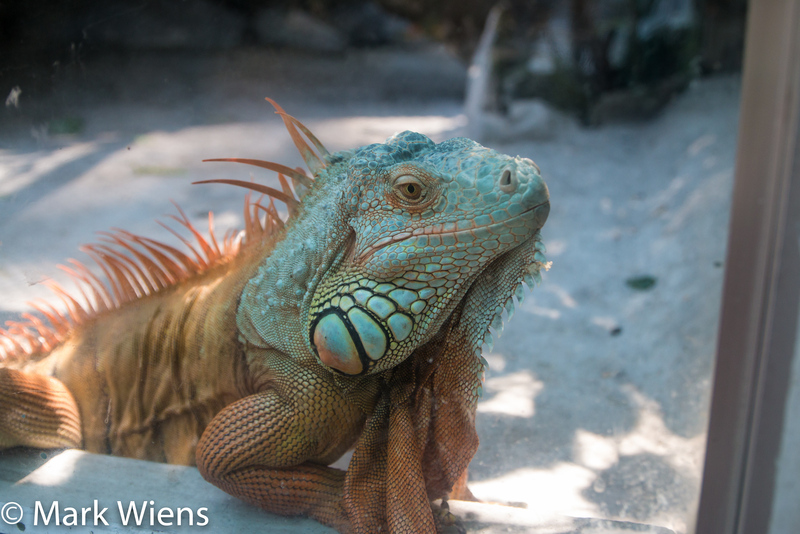 Sort of the entire zoo is a botanical garden, full of lush greenery and natural vegetation. But if you keep walking around, you’ll eventually come to the specific botanical garden section. 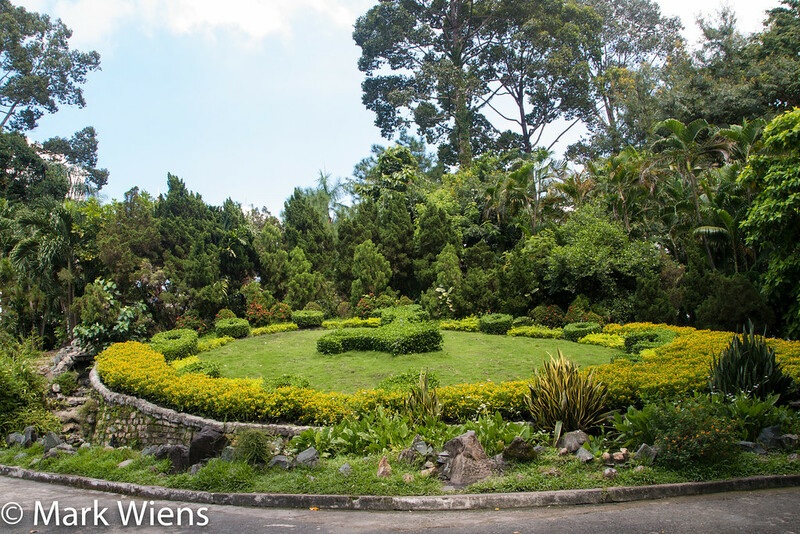 The gardens throughout the zoo and the wide paths surrounding by natural lush vegetation was a beautiful. When I went, it looked like many Vietnamese had come to the Saigon Zoo and Botanical Gardens just to hang out, relax and socialize with friends. It looked like many spent the day at the zoo, to use it more just like a peaceful garden park, like an escape from the noisy motorbike roads of Saigon. As with me, you probably won’t be impressed with the animals or the conditions of the zoo, but the gardens are beautiful, and it’s a good place to walk around for some peace and nature within Saigon. I think visiting the Saigon Zoo and the Botanical Gardens is one of the many great things to do in Ho Chi Minh city with kids, as it’s quiet, peaceful, with nice grassy areas, and you don’t have to worry about motorbikes! There’s even restaurant to eat at if you get hungry while walking around, and a number of little refreshment stations. How to get there: It’s easiest to jump in a taxi, but my wife and I took the bus down Nguyen Thi Minh Khai street directly to the entrance of the museum. Get out of the bus before you cross the river. 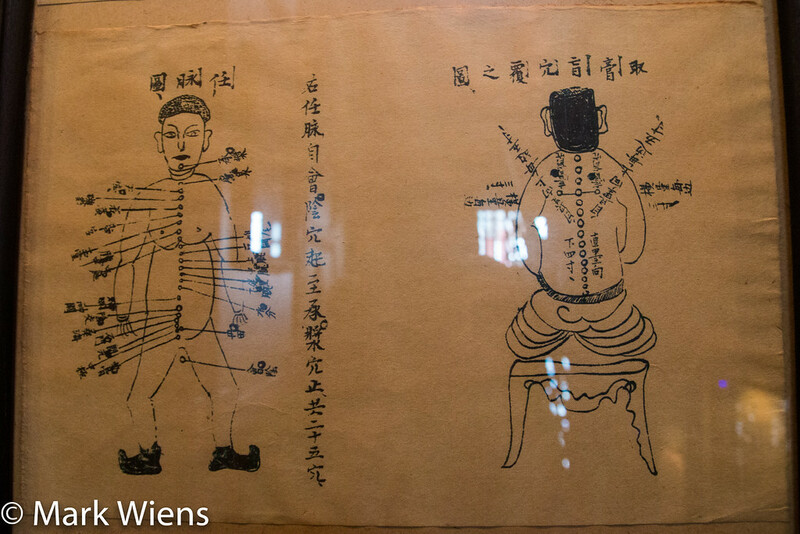 I really had no idea what to expect on the day we went to the FITO Museum, also known as the Museum of Traditional Vietnamese Medicine. But as soon as I paid the entrance fee, and entered the museum, I immediately felt welcomed (the staff were very friendly from the start), and the museum had a wonderful cozy, almost family run feel to it. After reading the pamphlet, I soon discovered that it’s one of the few privately operated museums in Ho Chi Minh City. 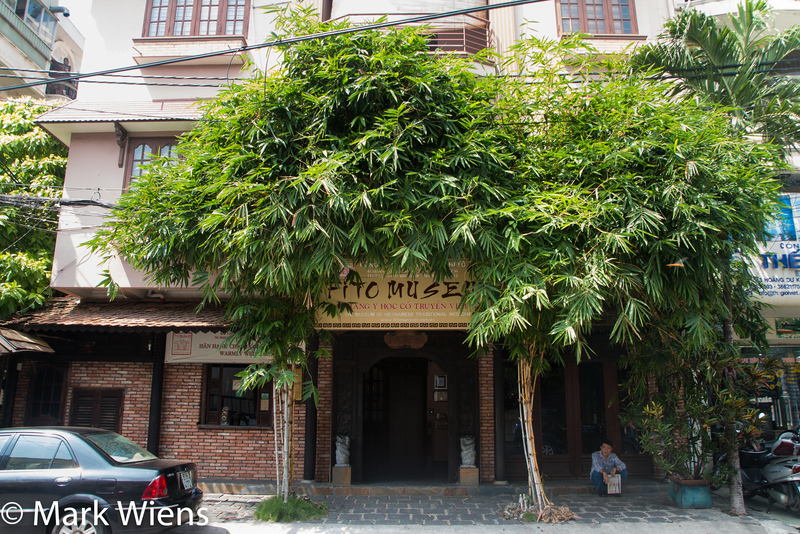 The Museum of Traditional Vietnamese Medicine is housed in a five story home, built and renovated to resemble a traditional style Vietnamese home. The wooden carved decorations and details within the house were incredible. Within the museum you’ll find a collection of over 3,000 Vietnamese medicinal tools, and a collection of manuscripts, manuals, and guides that document the variety of holistic herbs and natural remedies used in traditional Vietnamese medicine practice. When you arrive, you’ll first be invited to watch a short fifteen minute film about the progression of ancient Vietnamese medicine, and then you’re free to browse the museum at your own pace, or with the help of a staff member. I was not only impressed by the well thought out presentation of the museum, but also the kindness of the staff and the hospitality. Also, there were a couple hands on things to try, like putting on a traditional Vietnamese medicine doctor outfits, and rolling a sharp stone to grind medicine. Once you’re finished browsing through the floors of the museum, you can enjoy a complimentary cup of tea on the bottom floor in the small gift shop. They served me a cup of tea, used specifically to reduce anxiety, stress, and to help one relax… it was pretty good, and I did feel pretty relaxed (and ready to eat afterwards). I ended up purchasing a couple bags of ginger green tea to bring home. Overall, I was pleasantly surprised with the FITO Museum, and I thought it was a very educational attraction. How to get there: Since it’s a private museum, it’s located all by itself in the middle of a neighborhood in District 10, so the best way to get there is to jump in a taxi. There are numerous museums in Saigon, many of which I’ve covered in this list of top attractions, but there aren’t too many modern art galleries that promote the local artistic scene in the city. 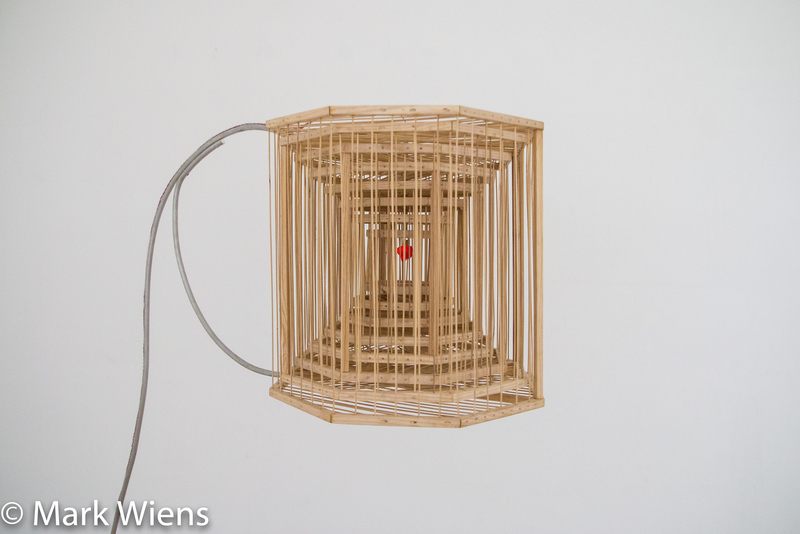 Sàn means “platform” in Vietnamese, and the San Art laboratory is really a place where artists can learn and nurture their creativity surrounded by other artists. The gallery is located within a home that’s converted into an artistic space. On the bottom floor you’ll find a small library with a collection of contemporary art books and a communal table where you can hang out and connect with other artists. Within the gallery portion, on the first and second floor of the space, there is a series of rotating exhibitions, so it’s best to check their website to see what’s currently on display. The gallery is very small and intimate, but it’s also personal and creative. 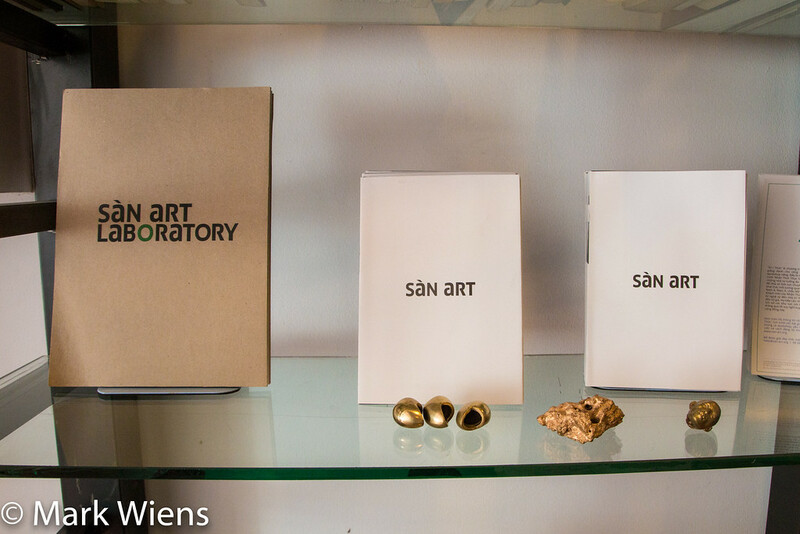 San Art Laboratory is open to the public, but I would only recommend visiting if you really appreciate contemporary art and creativity, which if you are, I’m sure you’ll be able to connect with other creative artists when you’re there. Also keep an eye out for special events and artist gatherings that they occasionally host. How to get there: The art gallery is located in a neighborhood right across the river from the Saigon Zoo. It’s easiest to take a taxi there, or you can take a bus to the main road and then walk into the neighborhood. 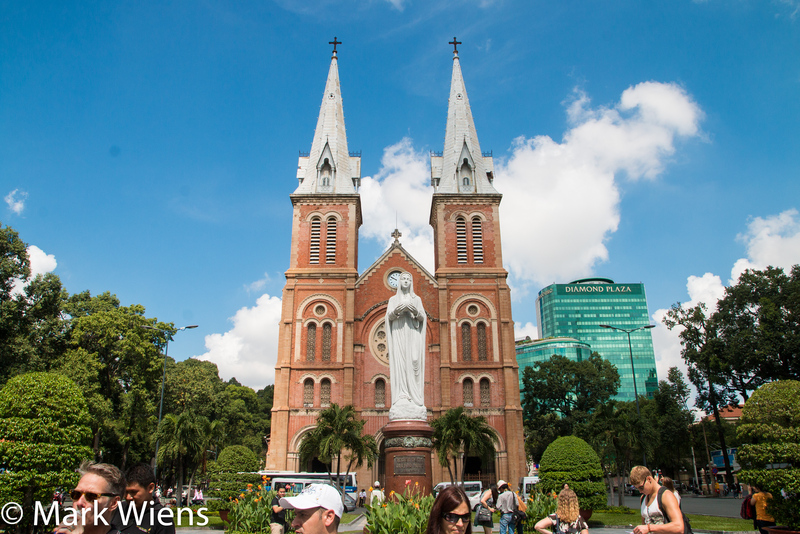 If you’re looking for one of the top local things to do in Saigon at night, you have got to head over to either the Cathedral of Notre Dame or the roundabout of Turtle Lake after the sun goes down. Located right within central Saigon, both locations are home to dozens of street food snack vendors that set up shop, and make snacks for the hundreds of young Vietnamese, both groups of friends and families, that come to hang out and socialize. At the Cathedral of Notre Dame, the snack and tea vendors set out little canvas covers on the planters where you can take a seat and enjoy the social buzzing atmosphere with the lights of the cathedral in the background. The park itself is very unmaintained, not very pretty, and resembles an abandoned structure. But at night is when things change. Just like at Notre Dame, young people flock to Turtle Lake to hang out and mingle with friends, eat snacks, and enjoy life. 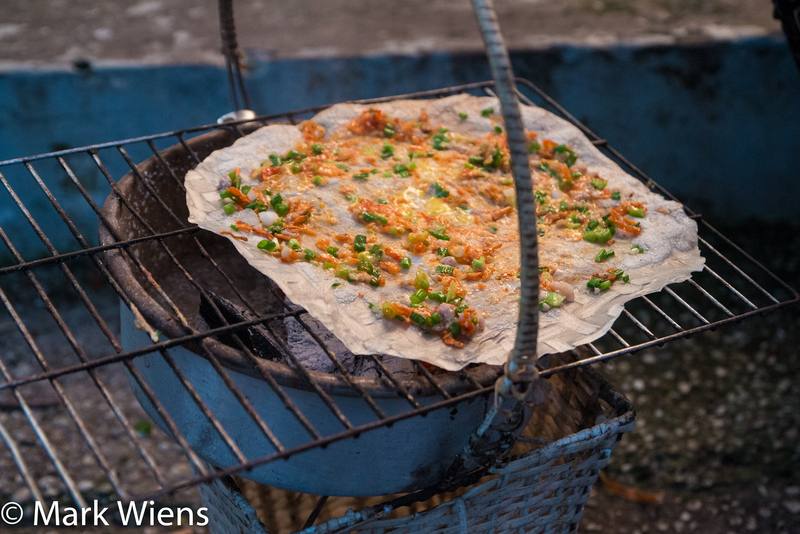 Banh trang nuong – Also known as Vietnamese pizza, banh trang nuong is also made with rice paper, which is grilled like a pizza crust over charcoal, topped with a quail egg, chili sauce, dry pork, green onions, among other things. I thought it was more like a Vietnamese taco, then a pizza. For a cultural evening experience, visit both places anywhere from about 8 pm – 10 pm. Like I mentioned at the top of this list of top attractions in Ho Chi Minh City, I really liked Binh Tay Market, but there was no way I was going to leave out Ben Thanh Market either. Even as touristy as it may be, it’s a buzzing market, full of history, shopping stalls galore, and being located in the heart of Ho Chi Minh City’s District 1, it’s probably the most important central landmark of the city. You’ll find just about everything ever created or produced in Vietnam somewhere within the market lanes of Ben Thanh. When I was there, I saw a frenzy of both foreign tourists from around the world, as well as Vietnamese shoppers. If you’re shopping for clothes, souvenirs, Vietnamese cookware, or dry foods like nuts or dried fruit, tea or coffee, you could easily spend a few hours getting lost in the tiny, stuffed lanes of the market. Just make sure you don’t knock anything over – they literally have things like glassware dangerously stacked close to walkways. 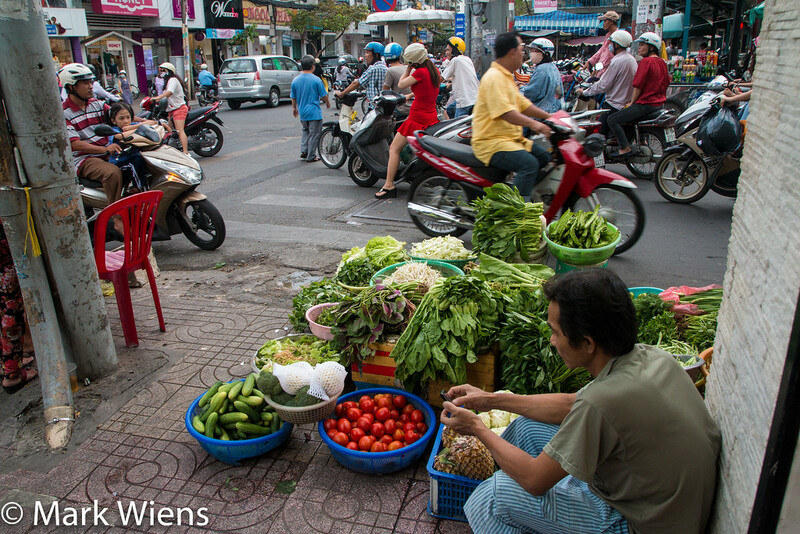 Additionally the surrounding streets of Ben Thanh Market are a major hub of transportation and a major business district, always full of action and energy. In the evening, along the roads just outside Ben Thanh Market, they close down the roads to traffic and open them as a night market with a few restaurants and touristy shops. This is one of the main night markets in Ho Chi Minh City, but I didn’t really care for it too much – it was a bit over hyped for me, but still a good place to walk around. How to get there: If you’re not already staying somewhere close in the area, it seems that all roads lead to Ben Thanh Market. Phu My Hung is an upscale development area in District 7 of Saigon, and while spending the day with Kyle (a local blogger and vlogger), we decided to swing by to see a different side of Saigon. Although it’s only 6 km south of the central Ben Thanh Market (considered the downtown), the area has a completely different feel to it from other parts of the city. It’s more quiet, there’s less traffic, there are malls and cafe’s, and there are wide spacious, uncluttered sidewalks; Walking through Phu My Hung almost feels like you’ve left Vietnam altogether and have taken a day trip to southern California. Phu My Hung is filled with an abundance of pleasant sit down restaurants, both Vietnamese and international, with big breezy patios, your choice of just about every fast food chain, from Lotteria to Dominoe’s, and plenty of Korean restaurants as well. If you go to Phu My Hung in the evening, you can enjoy the cooler temperatures, and it’s also when many local Vietnamese and expats are out and about, eating, socializing, and hanging out. 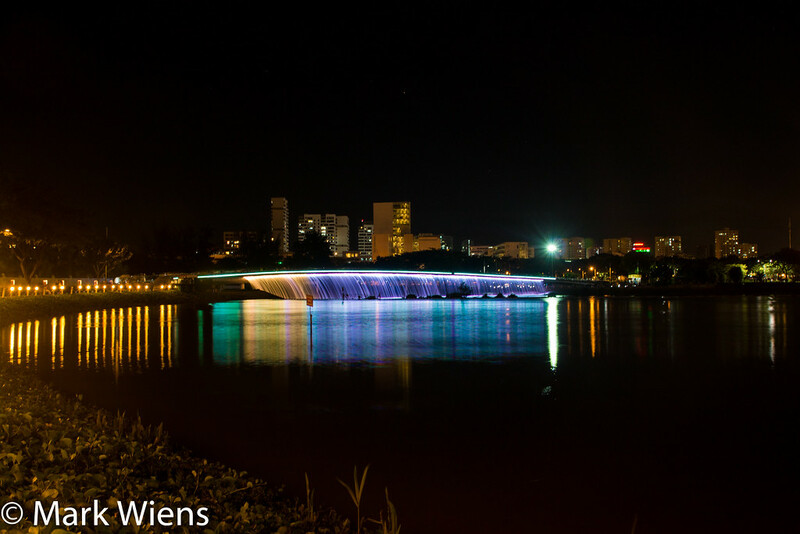 Along with restaurants, modern malls, and the shops that fill Phu My Hung, one of the main draws is the Starlight Bridge, a bridge that spans across the lake, with a waterfall cascading down, illuminated by flashing lights in a rainbow of colors. 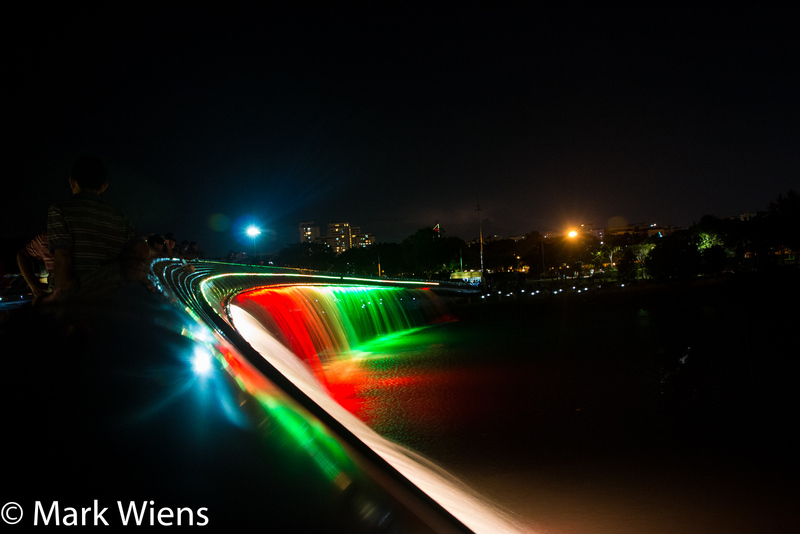 Spending time with your loved one at Starlight Bridge is said to be one of the most romantic things to do in Saigon. Although water puppetry originated in the north of Vietnam around the Halong Bay area, performances are also available at a number of locations throughout Saigon. The art of Vietnamese water puppet performing (known in Vietnamese at múa rối nước) has been around since the 11th century, and most of the skits depict Vietnamese cultural scenes, countryside life, and folklore stories. The puppets are made from wood, then they are lacquered to become waterproof, and then both painted and decorated, sometimes with paint, and other times with clothes or feathers. One of the most famous and touristy places where you can see a Vietnamese water puppet show in Ho Chi Minh City is the Golden Dragon Water Puppet theater. 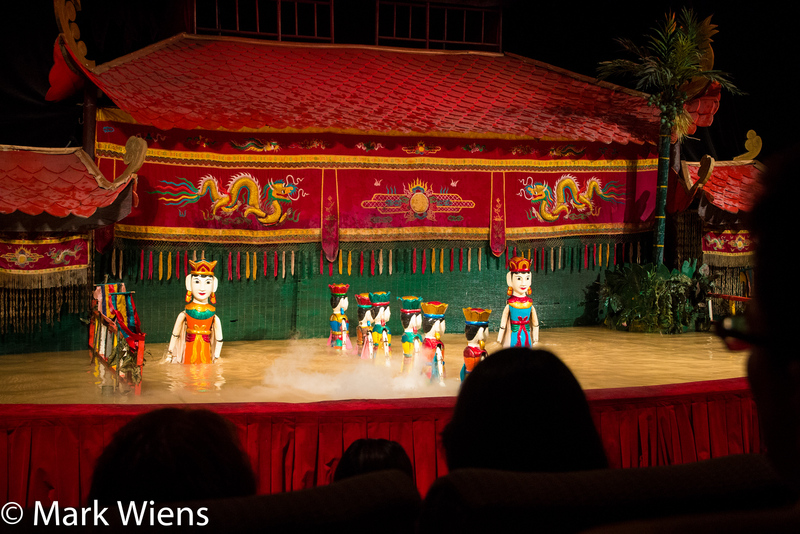 The show lasted for 50 minutes, and as the puppets danced and performed in the pool of water on the front stage, a traditional Vietnamese opera band played instruments, sang, and commentated the entire program. I thought the water puppet performance at Golden Dragon was pretty good. Although the majority of the attendees were giant tour groups, the show was still entertaining. It was interesting to not only see the puppets, but something I enjoyed was listening to the traditional music and singing that was synchronized to the water puppet show. Make sure to check the Golden Dragon Water Puppet website for up to date information about show times. I went in the morning to purchase my tickets for the evening show, but sometimes (as they informed me), they can sell out because of all the tour groups. 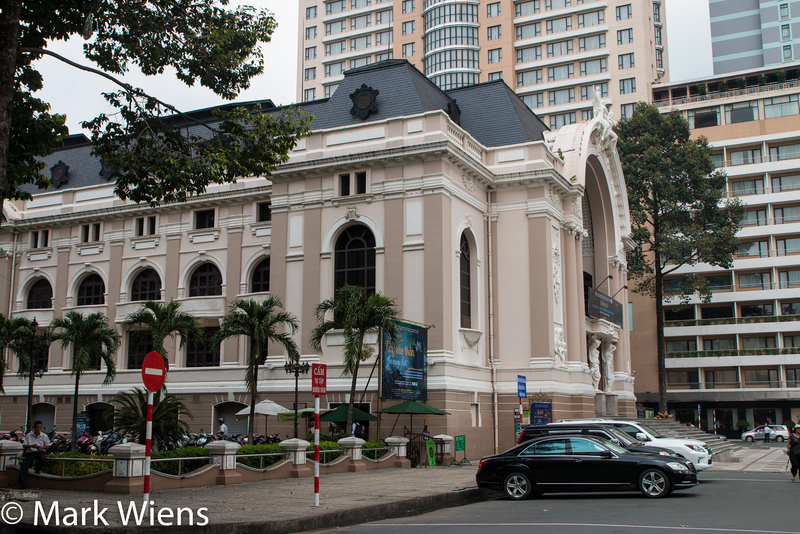 How to get there: The theater is located on the back side of Tao Dan Park on Nguyen Thi Minh Khai street, and just a short walk from the Independence Palace. 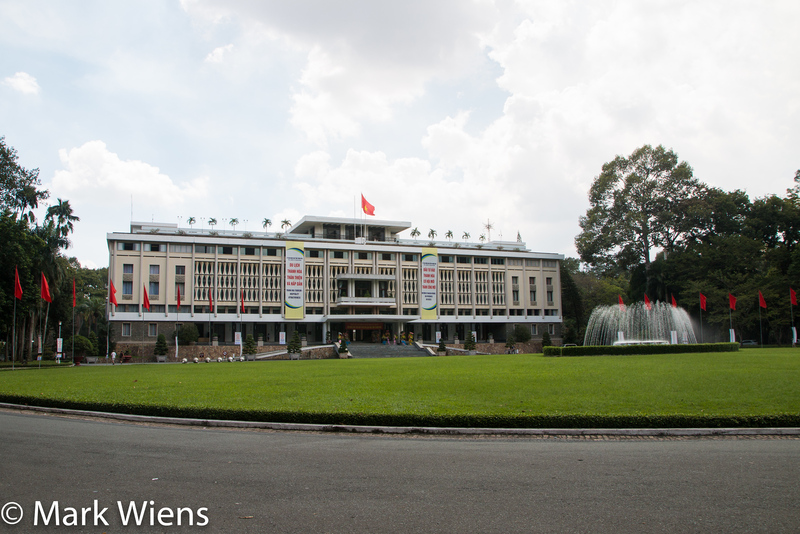 There are dozens of museums in Saigon, but the Museum of Vietnamese History is one of the most important. 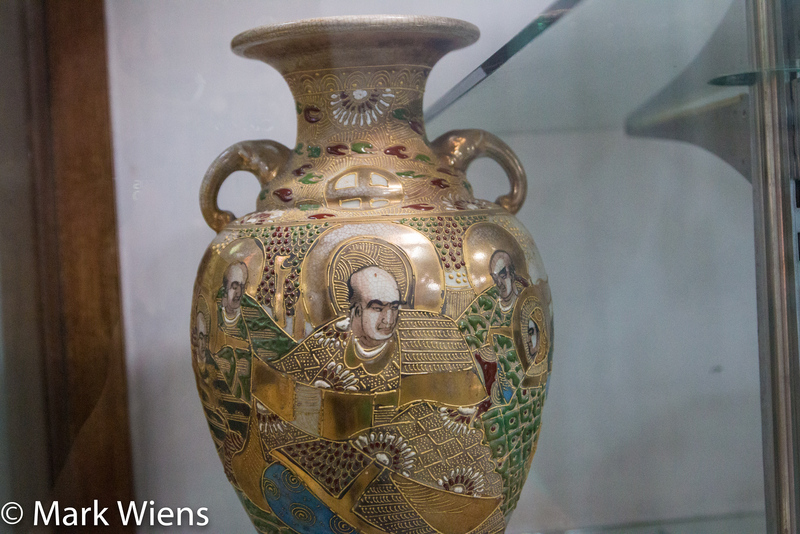 Inside you’ll find artifacts, including sculptures, pottery, and porcelain, showing the history of Vietnam, with artifacts dating all the way back from the bronze age of Vietnamese history at around 2000 BC. Probably my favorite part of the History Museum was the collection of sculptures and stone reliefs from the temples of Angkor Wat. Also don’t miss taking a peep at the well preserved mummy which was uncovered in District 5, right in the heart of Saigon. That was interesting to see as well. There’s also a traditional Vietnamese water puppet performance at the museum, which you can pay extra to see. I didn’t wait around for the show, but if you don’t have time to go to the larger Golden Dragon water puppet show (or if you want to avoid it), this might be a good alternative. 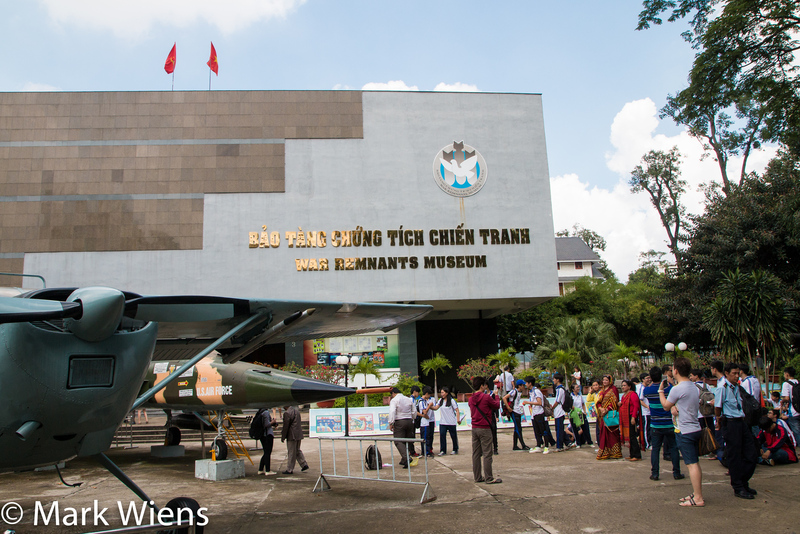 The History Museum of Vietnam is located right next to the Saigon Zoo grounds, and it’s a very popular museum for local Vietnamese students to visit as well. 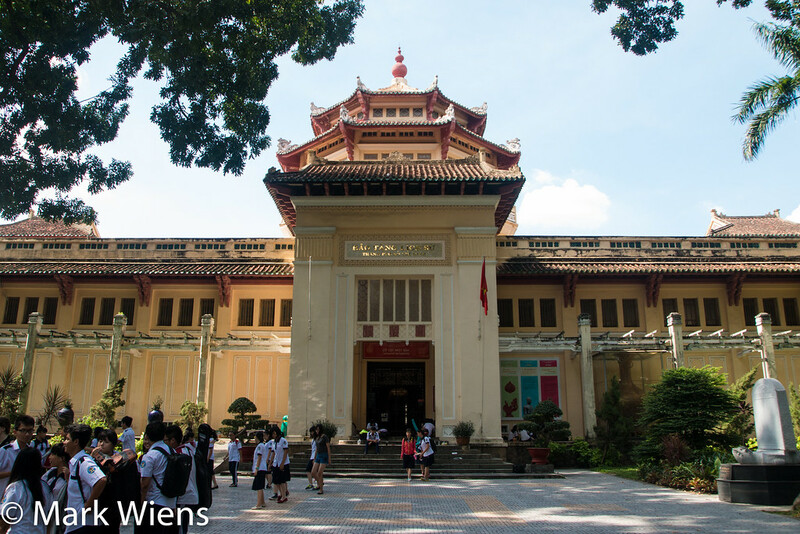 How to get there: The Museum of Vietnamese History is located right next to the Saigon Zoo, so you can easily combine visiting both, along with lunch at the Lunch Lady. Saigon is a rapidly developing and expanding city, and sky-rise offices and condos are going up at near frightening rates. Along with high-rise buildings, one of the recent trends in the city are rooftop bars and lounges. The streets of Saigon are loud, crowded, and quite often on the chaotic side – and don’t get me wrong, the street life is amazing – but it can also be very nice to see it all from above, in a peaceful environment from a bird’s eye view, enjoying the city skyline and sunrise with a cool beverage in hand. As of now, one of the most popular rooftop bar options in Saigon is Shri Restaurant and Lounge, which is not only a bar, but a full restaurant. You can go either just for drinks or choose to have either lunch or dinner there. My wife and I went to Shri for a late lunch, and enjoyed the wonderful views of the city, the upscale environment, and the top notch service. Another idea would be to go to a rooftop bar for sunset and enjoy happy hour, or an activity to do at night. Other well known spots to enjoy a drink with a view include the Hotel Continental and Hotel Majestic, but I’m sure there will be more and more rooftop bars in the future as more and more sky scrapers sprout up in Saigon. It’s amazing that you can be eating street food in an alley one minute, and seeing it all from above the next. Open hours: For Shri, 10 am – 12 midnight from Monday – Saturday and 4:30 pm – 12 midnight on Sundays and public holidays. Also, don’t miss their happy hour from 4:30 pm to 6:30 pm daily. Entrance price: Rooftop bars in Saigon can be a bit on the pricey side, but it’s worth it on a special occasion for the atmosphere and view. 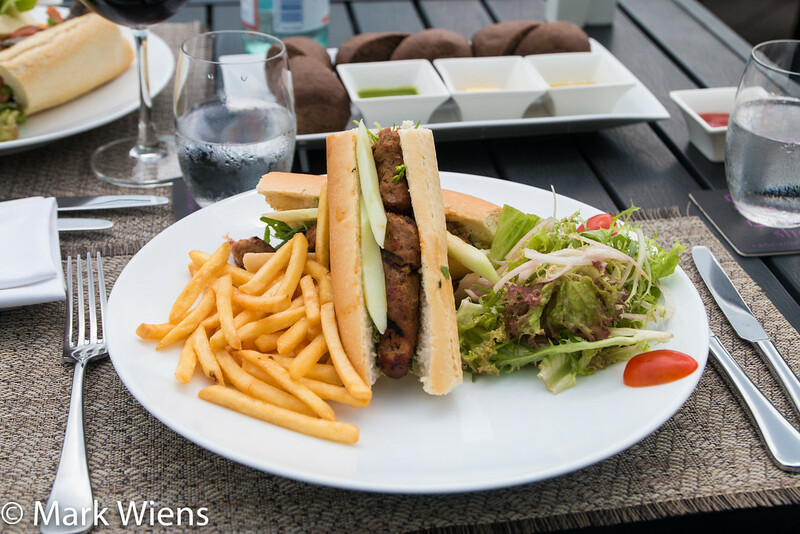 Lunch for my wife and I cost a rather pricey 850,000 VND. Like many of the museums in Ho Chi Minh City, one of the best parts of visiting is to admire the structure its housed in. 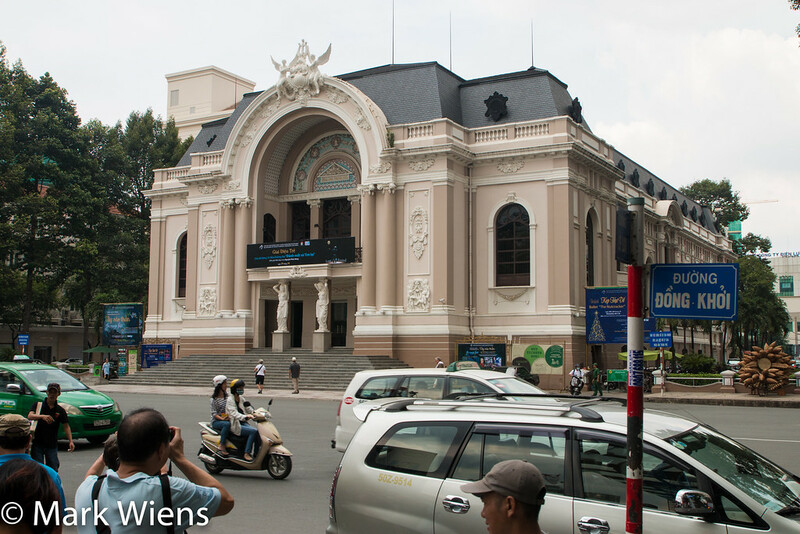 Possibly one of the most elegant and well preserved pieces of architecture in the entire city (at least what I thought) is the Fine Arts Museum of Ho Chi Minh City, located just opposite the giant roundabout from Ben Thanh Market. Inside the museum, you’ll discover a great collection of artwork, including many paintings, sculptures, and lacquerware, that span the history of art in Vietnam. One of my favorite exhibitions at the Fine Arts Museum was the collection of sandstone sculptures and ceramics from the Khmer site of Óc Eo, during the Funan Kingdom. You could easily spend an hour or two browsing through the art exhibitions at this fantastic museum. If you get tired out, there is a beautiful courtyard in the middle of the building where you can take a rest on a bench and just enjoy the peaceful quietness of the museum. At first I wasn’t extremely interested in visiting as I was sort of museumed-out, but I was pleasantly surprised at how nice it was. 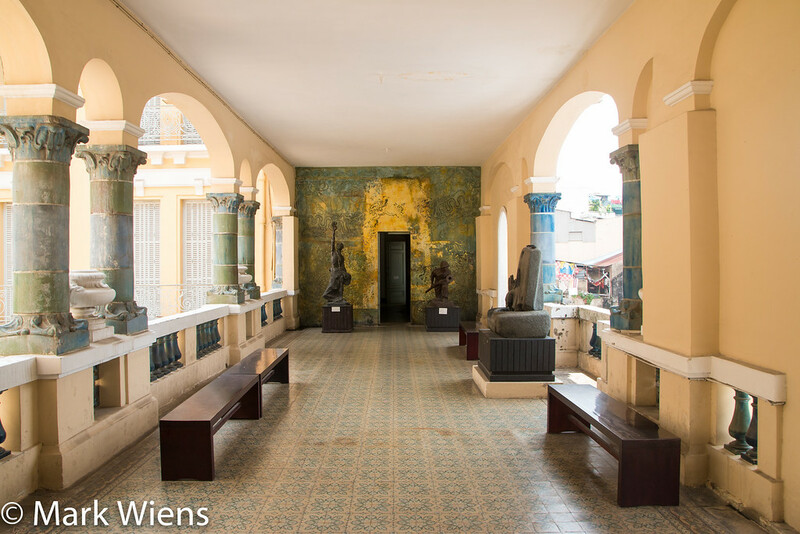 I thought the Fine Arts Museum was a hidden gem, and even if you just have 1 or 3 days in Saigon, I would recommend it as one of the top attractions in Ho Chi Minh City. 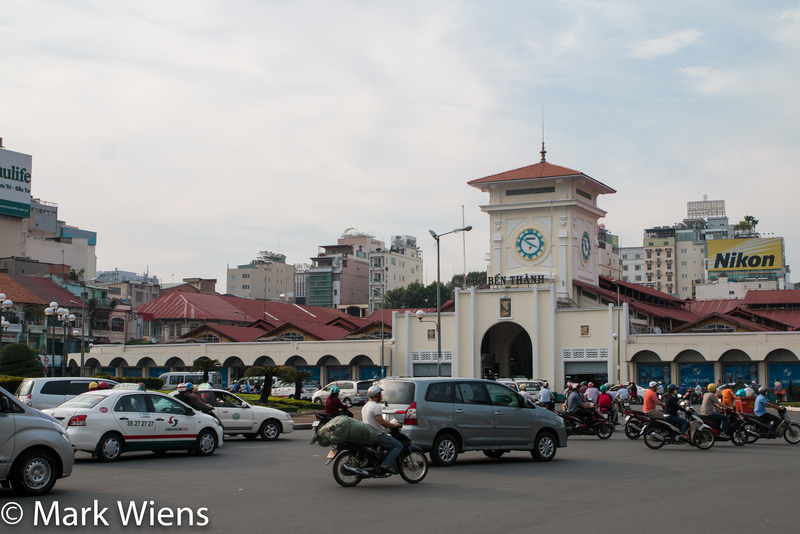 How to get there: The museum is located right across the roundabout (sort of to the south) of Ben Thanh Market. Dedicated to the Jade Emperor, one of the highest powers and deities in Taoism, the Jade Emperor Pagoda is one of the most important Taoist temples in Saigon. As soon as you set foot into the compound, the loudness of the road traffic outside drifts away, and you can immediately feel a sense of calm throughout the temple. The front courtyard is shaded by draping banyan trees, with a spattering of pigeons, and a cloud of incense smoke that burns both inside and outside the temple and sets the mood by making the entire area hazy. Inside the temple, there are two main sections, the back section is where the statue of the Jade Emperor sits, surrounded by various other deities and statues. The Jade Emperor Pagoda is full of symbolism and details, which I don’t even begin to understand or even probably notice, but nevertheless, it was an intriguing temple to visit. How to get there: The Jade Emperor Pagoda is located just off Dien Bien Phu highway, directly north of Ben Thanh and near the river. It’s best to catch a taxi there. 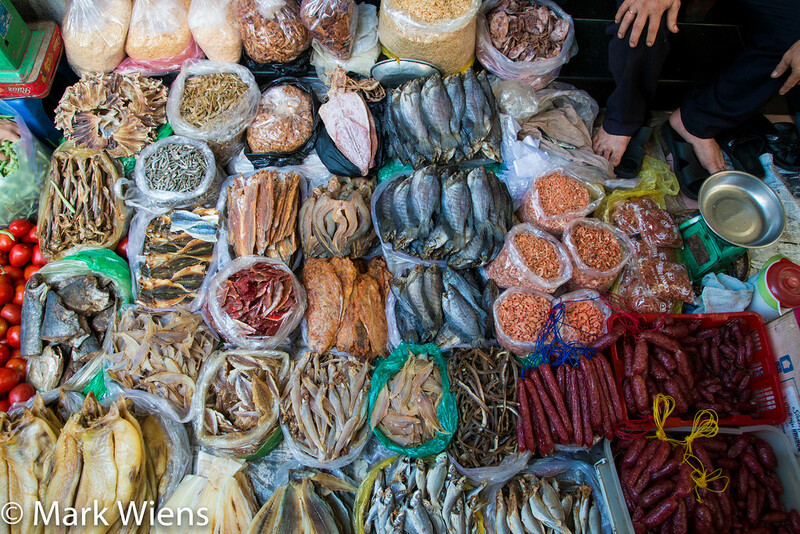 As much as visiting both Ben Thanh and Binh Thay Markets are wonderful things to do when you’re in Saigon, a trip to the city would not be complete without getting lost in one of the countless fresh wet food markets scattered throughout the city. While the other two markets mentioned above are more wholesale goods markets, right now I want to talk about neighborhood alley markets. It’s kind of like going to the supermarket in Saigon. Literally, sometimes I was just wandering around Saigon, walking around aimlessly, and the next thing I knew, down a side alley, I would find myself in the midst of a wonderful bustling local neighborhood market – I don’t know if I’ve been to another city with as many fresh markets as Saigon. The reason I love walking through markets in Saigon (or anywhere else) so much, is because it offers a REAL glimpse into the local life and culture of the destination. People sell and shop, hang out, sleep, eat and drink, and do just about everything you can possibly think of at markets in Vietnam. 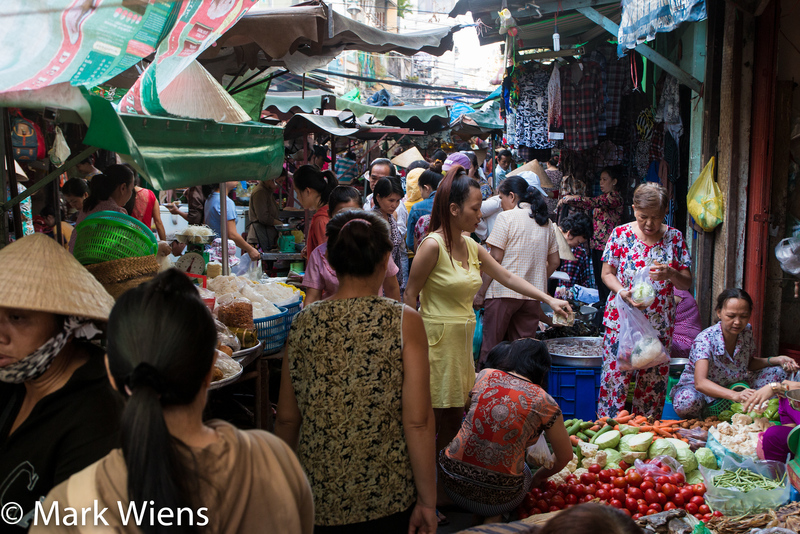 On top of that, I found that many of the people in the markets throughout Saigon that I visited were extremely friendly. Even as I walked by taking photos and videos, many people smiled and laughed and said hello to me and even invited me to stop for something to eat. Additionally, exploring a wet market in Saigon, you’ll see a near mind-blowing quantity and array of different vegetables, herbs, meats, and ingredients, all the raw things that makes Vietnamese food so good. 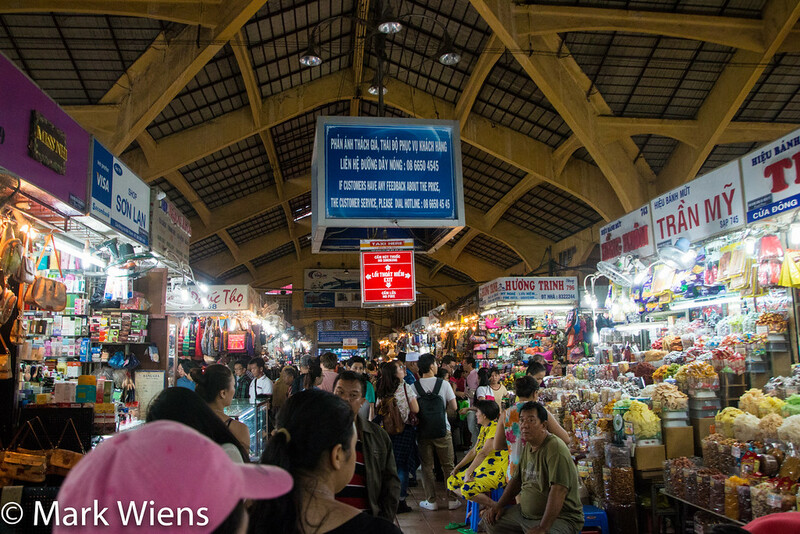 So along with visiting the two main largest well known markets I encourage you to go off the main paths, into the alleys of Saigon, and deep into some of the local wet markets to explore. 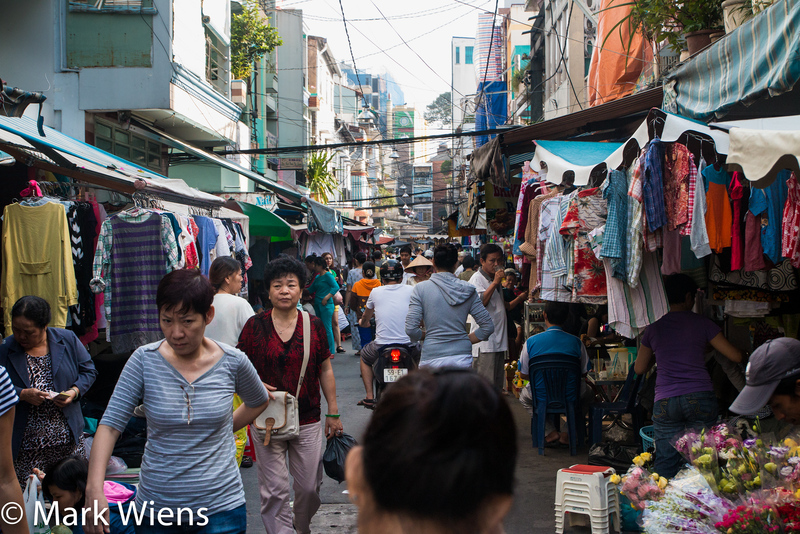 For me, learning about the local life by exploring alley markets was one of my favorite things to do in Saigon. Food and travel goes extremely well together. In fact, food is the main reason I travel in the first place (museums and everything else are all secondary to food)! 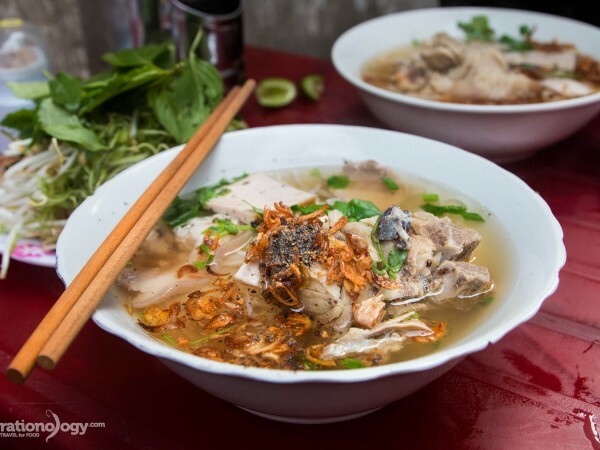 Saigon is an overwhelming paradise for food lovers, both because of the delicious flavors and combinations of Vietnamese food, and for the abundance, quantity, and variety of food available everywhere you look. Vietnam is a huge country that spans from the Mekong Delta in the south to the highlands of the north bordering China, and a coast line of 3,444 kilometers (source). 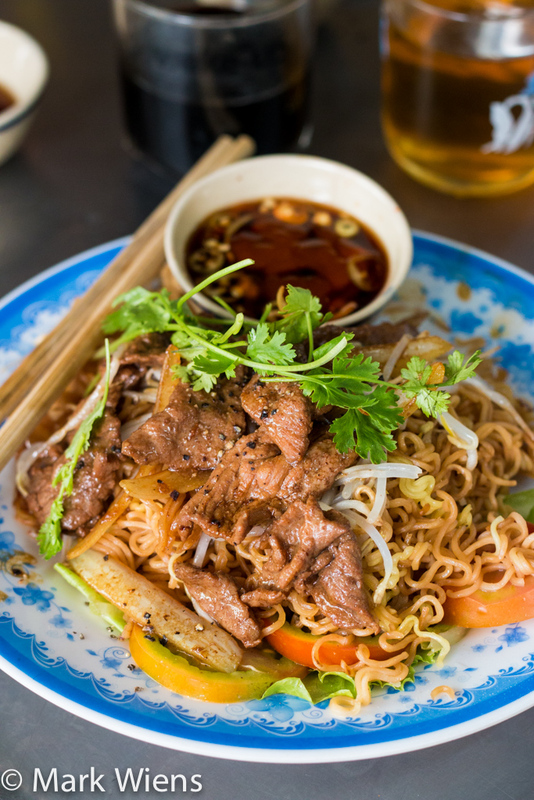 Since Saigon is the biggest city in Vietnam, people have moved to the city from around the country and the benefit for the food scene is that you can find nearly everything from around Vietnam somewhere in Saigon. But let’s talk about Vietnamese street food. 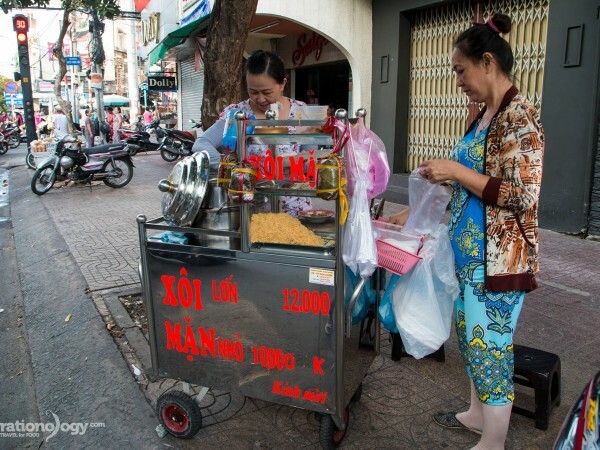 Street food is what I would consider a major part of Vietnamese culture. Along with being very affordable, eating street food is a way to socialize with friends, and enjoy the atmosphere of the city. You’ll find street food stalls set up in every neighborhood, along every street, and on just about every corner of Saigon. Yes, hot bowls of pho and banh mi sandwiches are widespread and remain very popular, but you’ll also discover dozens of other delicious Vietnamese dishes like bun rieu (crab noodles), com tam suon (pork chop over rice), banh khot (savory griddle cakes), and one of my personal favorite Vietnamese foods, bo la lot (minced beef wrapped in wild betel leaves and grilled). You may not always know what you’re eating, but you’ll have an incredible time tasting, and the experiences you’ll have as a result of being adventurous and samplings different foods is something you’ll never forget. 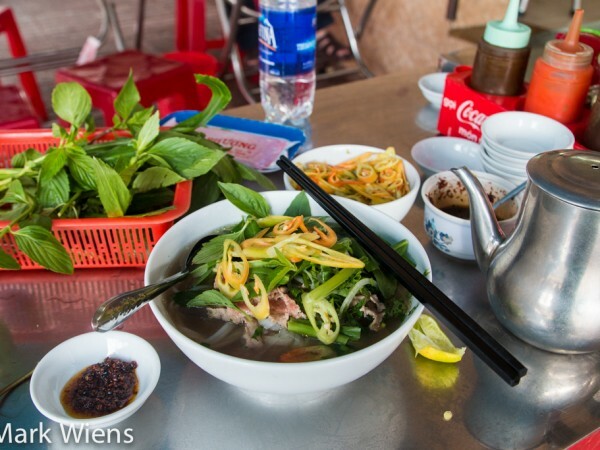 If you love food, be sure to check out my list of the best 25 dishes to eat in Saigon. Get ready to explore these top things to do in Ho Chi Minh City! Saigon (known officially as Ho Chi Minh City, though more commonly referred to as Saigon) is Vietnam’s most lively and action packed city, growing and developing at a rapid rate. As soon as you arrive in the city you’ll be surrounded by a sea of motorbike traffic, delicious street food everywhere you look, and a host of attractions that will keep you busy and entertained. I want to say a big thank you for reading through this list of top 23 things to do in Saigon and I hope it gives you great ideas and helps you plan your trip. Now it’s your turn to navigate your way through the bustling traffic, stop at a museum or market, grab a banh mi and slurp down a bowl of hot noodles on the sidewalk, and explore the many possibilities waiting for you in Saigon! Free Download: Since this post is so long, I made it into an eBook in PDF format, and you can download it for FREE (the eBook is easier to read and even print). I try download to save the pdf file unable. Can you solve this issue. Hi! How many days did u stay in Ho Chi Minh? Is 2 days and 1 night possible to enjoy the beauty of Ho Chi Minh? Thanks! UBER is not working in Ho Chi Minh!!!!!!!!! That is so a good information guide there. Big thanks for this. Very informative and this would be a great help for us since my family will visit this Dec 2018. Kudos to you!!! great guide !! super interesting facts and advices much better than Trip Advisor, last time i went there i really enjoy a dinner cruise onboard the bonsai legacy it was nice to discover saigon by night from the saigon river. Very informative. I have been to Ho Chi Minh but has visited only a few places mentioned here. A Really informative and detailed review of Ho Chi Minh City, which will be extremely helpful when my wife and I visit there in February 2019. Also downloaded the information, which will be a big help. Ho Chi Minh is really an awesome place to see that I ever want to visit, I just love this place. This place is also known as Saigon. There are many places of attraction like historical sites, include reunification palace, war remmants museum, city hall museum, Ho Chi Minh museum. Also there are some religious sites such as Central mosque, Notre Dame Cathedral, thein Hau Pagoda, Quan Am Pagoda, Phung Son Tu Pagoda. Including architectural attractions like Saigon opera house, The Bitexco Financial Tower, Saigon Sykdeck. So you would definitely enjoy these places and you can get a memorable experience of Vietnam tours. I have seen these places which were a very good experience for me. Very nicely explained. I am going to visit shortly. I am soon going to be in Saigon and this was incredibly helpful! This brings me to a question, which museum was your favorite one? I am definitely planning on seeing a water puppet show at the museum, it’s great that they are offering that (provided that enough people show up!). All those markets sound amazing, I can’t wait to visit! I am a Saigonese. Your article is very helpful to Vietnamese students. Welcome here! I just left Saigon and to be honest, I didn’t care for it that much. The street food is amazing if you get out of the tourist areas. I’m so glad you didn’t mention the tunnels as a place to visit. For one, all the tunnels you see are not from the war time and are built for tourists, not for actual history. Second, our tour guide was so proud that the traps injured “Americans” and that the north was doing right by killing hundreds of thousands of southern vietnamese ciivilians for letting Americans invade vietnam. He obviously wasn’t told history of what happened, probably because of the oppressive communists government. Anyway, food was amazing, but everything else was forgettable, especially the bad drivers, which I thought Bangkok was bad…not even comparable. Its nice to know that you were able to go to a lot of places in Saigon! I love how detailed and useful it is specially to those will go there for the first time. as a Vietnamese living in Saigon, i read all your article, honestly there are still some places i havent visited yet but your all your recommendation is correct, your mention about safety is right, who know what will happen. i just want to add another thing : here we prefer Grab than Uber, it is cheaper and larger amount of Graber, you can find Grab bike and Grab car , it is just half cheaper than traditional taxi. and within 100 km from saigon, there are many places more to visit like Cu Chi Tunel, Vung Tau City, Rung Sac ( Sac forest National park )… I hope every people have a good trip in Vietnam. How far is the cu chi tunnels from this area? Thank you very much for this magnificent guide. We like to get around by bus and figured out that there is an awesome app for planning routes. It works completely offline. It is called “BusMap” by Le Yen Thanh. It works like Uber and suggest you the possible routes. I love this city where I lived for one year, 10 years ago. I remember that the people at the zoo preferred to photograph my son (blond with blue eyes) than the annimals! Great post, Mark – used it to get around the city today and had a great time. Agree with you the tiles at the post office are to die for! Love this city – there’s so much to enjoy even the chaotic traffic can be fun to watch!! Hi Mark, I’ve been watching your videos for a year now. It was really helpful with the Thailand videos. We were in thailand for the month of May 2017, touring BKK, Chiang Mai and Koh Samui. I’ve been sharing your videos with friends and whoever would like to listen to my info about this American son of missionary/Christian who lives and married in Thailand. I’m so proud of your work like a proud mom. My daughter is a Social Media Specialist. We visited Gaggan in BKK and other food markets. Next time we visit Thailand again I will surely connect with you. For now, I am planning a trip Vietnam somewhere in Nov. 2017. Possibly will stay in Vancouver, British Columbia Canada for now. We have great weather here in Vancouver in the summer. We have been vacationing in Europe for the past few yrs. but now Asia is my new destination, esp. Vietnam. Your work is awesome, as a Christian myself , may God richly bless you and your family , Ying and Micah. Hello Mark! This is so far the best blog I’ve found on Saigon. Extremely useful and it gave me all that I was searching for. Will be going to Saigon for 3 days in April, energized now! You rock ! Hey Mark! This is so far the best blog I’ve found on Saigon. Very informative and it gave me everything I was looking for. Will be visiting Saigon for 3 days in April, excited now! Thanks a lot ! Thanks Larry, hope you have an amazing trip. Hi Mark, loved the YouTube video coverage of your HCM trip. Just a note on FITO: Admission tickets are 120,000 dong as of now (Feb 2017). Hi Mark. Thanks so much for sharing your video of what to do in HCMC. We are heading to Vietnam in April however really only have 2 days to explore in HCMC. The sights you suggest to visit – are they in order of preference and are they close by to each other so that you can get yourself there and then walk around to explore? 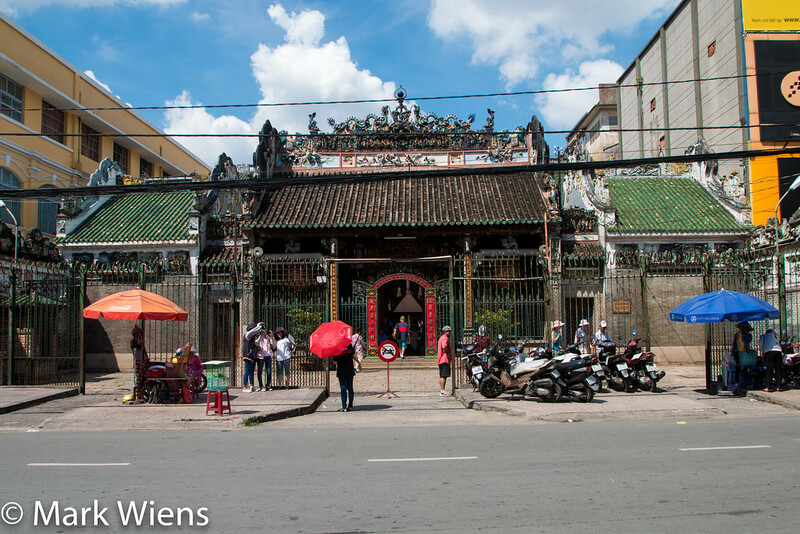 if you are only 2 days in Saigon, I recommend you a tour called URBAN TALES which takes place in Cholon (Saigon’s Chinatown) which is for me one of the most interesting districts of Ho Chi Minh City to visit, as still very typical. Perfect item. It’s a different culture, I feel like knowing. What an excellent article! very informative indeed.. Thank you my friend. last minute. If it wasn’t for your concise and straight to the point explanation, I’ll be going bonkers by now. I included many of the places you recommend above, will be going to Cu Chi tunnels as well. Hope all goes well. Do please continue with what you’re doing, it helps clueless first timer like me a lot. Appreciate heaps. Merry Christmas and a Happy 2017 New Year to you, God Bless. Oh thank you for this! So informative and helpful; will be reading and rereading this until I head to Saigon in March! Watched and read your Saigon info. Very informative and probably the only place we didn’t manage to get to was District 7 and the Starlight Bridge. All of you comments/reviews are spot on. Pho and Banh Mi were outstanding!!! We did a whole tour of the country and loved every minute of it! Would re-visit in a heartbeat. Hi Dave, great to hear from you and glad you had such a good trip to Saigon. So much amazing food! Hi!, Great reviews and photos u have here! one thing i wanna ask, what camera u used when go here? did u recommend bringing a DSLR or just action camera (GoPro)? Amazing blog! Thanks for sharing with us…! Hi Mark. Thanks for your great post. I want to contribute one of the important tips when traveling to Saigon is having a local friends. They may help us a lot cuz they know the price, places, the way and many things else. Thank you, This video is detailed and very informative. Will be in Saigon in two weeks i will definitely go to the places you’ve shown here. Great to hear that, hope you have an amazing trip. Hey man, im going to Saigon next week and this article is really helpful and wonder ful especially about taxi thing. Thank you very much. May God always with your family. Wow, great effort to give so much information, it really helped me so much to decide the places to visit.If not I would have missed some beautiful places.thanks a ton. Good info! I bought my tix to the water puppet show after reading your article. continue the honest reviews! your authenticity and bluntness is def just right. thanks again! Mark, your post is exellent. Could I copy to my web site ? This is by far , beside the top 25 Vietnamese food – are the best guides to Saigon I ever read , thanks very much ! Hi, I love to explore local market. Could you tell how I can get to kind of Saigon local market like this: https://www.youtube.com/watch?v=rjilx-jlwyg ? Enjoyed reading your blog. We’re from Calgary, AB are planning a trip next year to Ho Chi Min City. This is really helpful. Thanks! Hi Nan, good to hear from you. Hope you have an amazing upcoming trip to Vietnam next year. Thanks for the correction Alex. Hi Kathy, glad to hear this guide is helpful. Have a fun trip! This is a great list. Thanks for putting it up. Really helped me in planning my upcoming visit to the city. I had your video and the ebook when i visited the Saigon in march 2016. You should mention the Saigon beer too.. I was surprised it was cheaper than cold drinks in some places. Thank you Vikas, good to hear that. Glad you enjoyed your visit! My family and I will try out some of your good discription! Hi Peter, great to hear that, hope you and your family have a great trip! Thinking of going to HCMC this Aug. with my best friends from school and your site helped me planning my trip there. We ll be coming from BKK. It seems lots of ppl there can speak English. I ve been in nyc for almost a decade. This ll be the first trip we are taking together after a school trip almost 20 yrs ago. Btw, I m only 31 and quite a fan of your work. Keep up the good work! Great and useful article. Helps me a lot in plan for my trip. Thanks for sharing. Thanks Mark for taking the time to record and write such an informative article. I’ve just booked a trip to Saigon for next week and am looking for things to do there when I came across your page. This infor is timeless and I’m sure I’ll benefit alot fom it. Travelling March 31st, 2016,,,,,,yeah!! Do you have anything on Pueto Rico? Hi Suan, you’re welcome, glad it’s helpful. Hope you have an amazing upcoming trip. I haven’t been to Puerto Rico, but I’d love to visit in the future. When you will visit the Cambodia? Hey Sophy, I have been a couple times, but it’s been a while, I’d love to visit again soon. Nói về Việt Nam mà phần comment không thấy chữ tiếng Việt nào hết, cho nên Nhan Tran đây nghe hương vị que hương mà sao vẫn thấy hơi lạ lạ mà ko biết cái gì. I have read many articles about Saigon from different travelers and backpackers. Even the Pro ones. I have to say this one is really helpful and detailed. As a Vietnamese, I really hope everyone who comes to my country can find something interesting and have good memories here. Great job, Mark! And thank you for writing about the city. We really enjoyed this video. You provided so much info that we can use in Saigon. I will be ordering some of your t-shirts. I will be viewing more of your videos. We are heading to Vietnam in March and this article is brilliant! Tks for all the great info! The Saigon bus system is fully loaded into Google Maps, and now that I’m living here (and deathly afraid of riding motorbikes) I use Google Maps to tell me how to get around by bus, and it hasn’t let me down yet. Much easier than studying a bus map. Just enter your destination and click the Transit option and you’re good to go. But the buses stop running by about 21:00, so after that it’s walking or a taxi for me. Hey Jim, thanks for sharing. Glad the buses are working out so well. I took them quite a few times during my visit, and always went smoothly. Thank you Minh, I would love to go on my next visit to Vietnam. Just follow up your blog for a long time. Thank you for your determination on giving us such great info. From your recommendation, I had a memorable trip to Ho Chi Minh and this is my itinerary for 4 days in that city, it’s a budget plan. Once, thanks for your guidance to make our trips much easier. My family and I came back from Saigon last month November 2015. You are certainly right when you say that the best way to explore is walking. The alley streets had an abundance of culture living that you can actually witness. There are chickens and dogs roaming as motorbikes maneuver around. Street vendors looking on their smartphones. Locals drinking coffee on plastic stools. It’s different dimension that I won’t get any where else. I’m curious to visit the modern Saigon that you touched upon. I’m an avid runner and I was excited to learn there is a race called “Conquer the Phu My Bridge”. This would be my first international race. Thanks for your insights. Will keep it in mind for my future Vietnam adventures. Hey Phuong, great to hear from you and glad you had such a fun trip to Saigon. That race sounds fantastic! In Saigon now and I’m so impressed! This is such a thorough overview of the city as well. Loving it here and will use some of your suggestions, thank you! P.S. Loved the bit about the motorcycle taxis – they really do just kind of lounge around all day, it’s quite funny. Hey Gloria, thank you very much for reading, really appreciate it. Glad you’re enjoying Saigon! Thanks a lot for sharing us a valuable tips.I am planning to go vietnam 21 December 2015. I love to travel and I am a food lover. I am so happy and enjoying to read this. It will help me to travol there. Thank you so much once again for your tips. I am planning to go vietnam 21 December 2015. I love to travel and I am a food lover. I am so happy to learn all those things which will help me travol there. Thank you so much once again. This is such a great post thank you! I’ve just planned my next few days in HCMC! Your blog is very informative. I am going there with my mum and sis two weeks from now. Hey Melissa, glad this is helpful. Hope you have an amazing upcoming trip. Just wanted to say thank you for your tips on what to eat at Notre Dame and by Turtle Lake. It was delicious and the locals were super friendly inviting my boyfriend and me into their own atmosphere. I’d also like to recommend Chill Skybar. It had an amazing view and the staff made you feel like a celebrity (and slightly underdressed, they all looked amazing). Just make sure to go there when it’s dark though, the city lights make it so romantic and absolutely magical! Anyway, really enjoyed reading about all your tips! Hope to see more of them coming on any possible destination. Wishing you and your wife good travels! Hey Tanya, thank you very much for sharing, and glad you really enjoyed the Turtle Lake area. Thank you also for the recommendation, sounds great. Hope you have safe travels as well! Hi Api, good to hear from you, glad this guide is helpful. Yah, I think there should be plenty of options to find a place to stay if you just show up and look around. Enjoy your trip! Mark you have the all time greatest travel advice really have helped me out in my travels! Great to hear that Dean, glad it’s helpful. Thank you Mimah, glad you found it useful. You know more than many saigonese!!! I’m from Vietnam and I’m living in Ho Chi Minh City. Thank you very much for the extremely helpful infomation about my lovely city that you gave all your readers. I’ve been following your blog for a while and totally love all your videos as well as articles. There is just one thing I don’t feel good about your and your wife trip to Ho Chi Minh City : I should have known you sooner so I could suggest where you should go and even should take you two there when you visited my city. I wish I could even do more than that, like offer good hotel rooms and good meals like what I had watched in your trip to Malaysia Langkawi and Manila. I just want to make sure you would experience as much as you can even though your articles are pretty clear and your food blogs are excellent. I will just keep watching and supporting you and Ying and hope one day my ideas could come true. Best wishes. Hi Christine, you’re awesome, thank you very much! Next time we come to Ho Chi Minh City we will let you know. It would be great to meet you and eat with you! 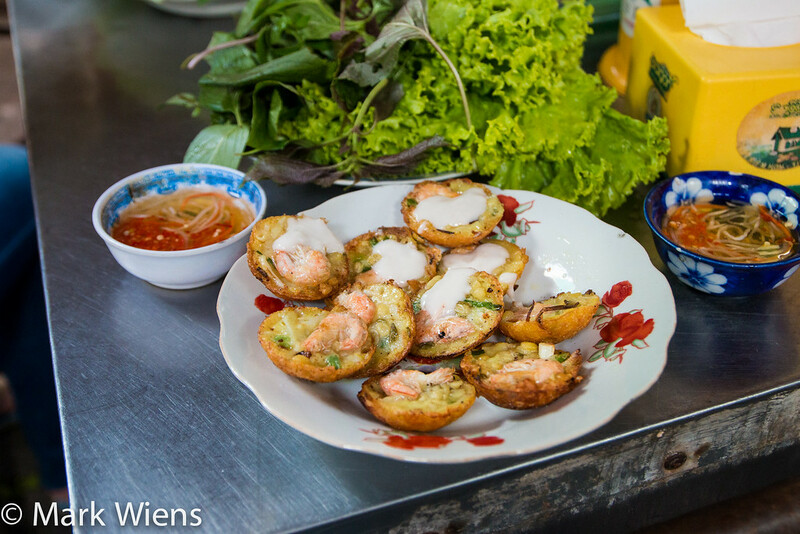 What is your one of your favorite foods to eat in Ho Chi Minh City? Thank you again! Hey mark I like you blog. I watch you travel around the world eating those food makes my mouth full of water. Now I’m vegan. live in New York. I’m from Thailand every time you eat Thai food I can feel what it test like by watching you eat. I am following you where ever you go. Keep up with good work. Hey Paul, good to hear from you, thank you very much for the comment. Do you get to come back to Thailand often? Thanks for the reply. I haven’t been back to Thailand about 14 years now busy with work. I work on the computer all day long. When I got a break always check your blog I saw some Thai dishes I m not familiar with I just enjoy watching you enjoy eating food I also enjoy seeing different culture different food its amazing. What amazed me is that you can eat and not gain weight. Keep up with good work talk to you soon. I think you should also visit outside of Saigon to have an overview. Hi Nihan, yes I would love to. Didn’t have time this visit, but I hope to in the future. I’ve read dozens of your articles and this is my fav so far. Man you worked like crazy during this trip. Excellent stories and awesome professional photography. If I’m ever in Vietnam at the same time as you are, I’d be stoked to camera crew with you for an afternoon. Cheers Mark. Really appreciate it Mal, thank you! You are right Mark. These are almost attractive destinations you can see in Sai Gon (China Town also). Your post is very useful for us to sure that we will not miss any must see places and things. 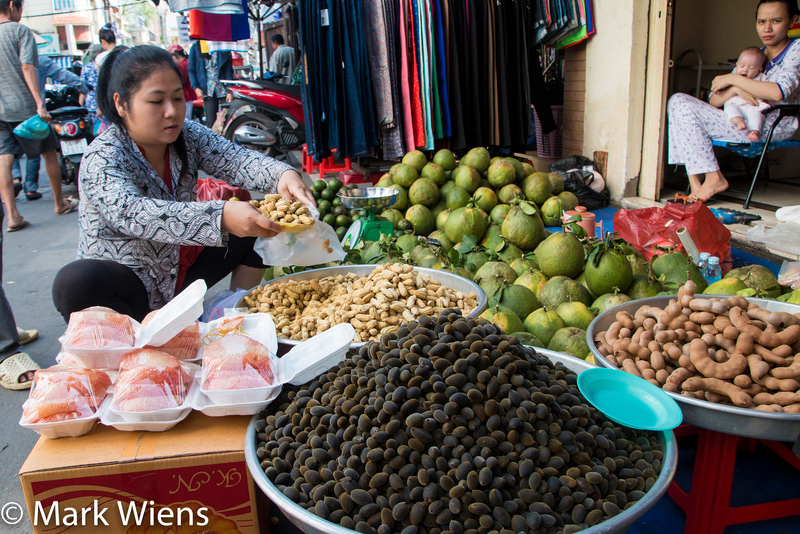 PS – As a vegetarian, it can sometimes be difficult in Vietnam; I appreciate your comments whenever you find veg options. Thank you very much Jeffery, really appreciate it. Hope you can visit Vietnam soon. Love everything you do Mark! Hey Trystan, thank you very much, really appreciate your support. I’ll think about some tours, that would be cool, and I’d love to meet great people like you. Are you living in Vietnam now? Thanks for sharing Jay, keep it up. Very informative as usual. Always love reading your blog or videos(although not as much as before, really busy with work and whatnot.) Hope to read a blog about Singapore or Taiwan, perhaps parts of China. I was just there this past May. Thank you for reading Joy, glad you enjoyed it. Sounds good, I have some posts coming soon from Singapore, and I’d love to visit Taiwan in the future. Did you visit all three of those places? Thank you Michael, good to hear you’ll be visiting soon! Hi Mark! Thanks for another very useful video – I have been watching your videos for some time but hadn’t got around to commenting. I am planning a trip to Vietnam (via Bangkok!) for March 2016 (my first time in SE Asia!!) so I can’t wait to try out these suggestions. I’m especially looking forward to digging into the delicious looking street food, both in Vietnam and Bangkok 🙂 When ordering in Ho Chi Minh City can you get by in English or do you need to know some Vietnamese? I am worried I won’t know what I’m ordering! Hey James, thank you for the comment, glad you’re planning to visit SE Asia next year. As for ordering, not many people speak English, but one of the nice things is that Vietnamese is Romanized, so you can recognize the signs for different foods. And then once you see something you want to try, you can just kind of mention you want one plate or bowl of it by holding up a finger and smiling. This worked well for me! If you have time to learn a few phrases that’s always helpful and beneficial, but you can still get without. Many people in Saigon are extremely friendly. Thank you. I have been to Vietnam before and will go again. I have seen a lot of the places you talk about but not all. I look forward to seeing more. I have found no matter how long I stay in Vietnam I can never see every thing there is always more to see and more food to try. Again thank you. Hey Steve, glad you’ve been to Saigon as well. I fully agree, with you, I feel the same! Hi Michael, you’re welcome, thank you for reading. Perhaps you could check out Travelfish (http://www.travelfish.org/) for more info regarding medical and safety, and also do some browsing or asking on forums, and also there’s some good info on the Lonely Planet website. All the best! Thank you for a great video. Makes me want to visit Saigon! Thank you for watching Lisa. What is the tall architectural masterpiece that is standing next to the Rolex building in your first photo? I always read your posts and wonder at the stories you have to tell people, all because you decided to LIVE your life instead of letting it pass you by, and to see the world not as it’s told to you but on your own terms. Hi Luke, thank you very much, really appreciate it. That building is the Bitexco Financial Tower, the tallest building in Saigon! Very interesting Mark and nice pictures! I thought this place was completely run down but it looks actually quite okay on the pics. However, the safety issues mentioned would be a big concern. I’m used to Bangkok and Barcelona – places where crime is present – , but Saigon seems to be on another level. Hey KE, thanks for reading. Overall though, I think the safety issues should not take away from visiting. Nearly everyone I met was extremely kind and helpful, and I had no problems throughout my stay. But it’s just important, like in any busy city, to be aware. Wonderful guide book. Will use it for our Saigon trip in December. Mark that was a very good guide you made. I will download it and make it my official guide to Saigon. Good timing as I have been researching for our December trip with family. Good job! Hey Nancy, great to hear that, thank you for getting it. Hope you can plan a trip to Vietnam in December! Love to read this. You missed to mention the first and original rooftop bar, Saigon Saigon Bar at the Caravelle Hotel. It’s also historical being the place where the news people who coveraged the Vietnam War stayed. Hey Noel, ok great, thanks for sharing that! A great bar and some good bands at night. The prices for drinks is also ok. If you like you can just go up and take pictures at no cost. Hey Liem, great to hear that you’re living near Saigon. No, I’m not there anymore. Are you from Vietnam? Yes I am, but I’m moving to Australia soon. Love your blog! Thank you so much for the useful info. Your website really gives me helpful insights as I will be travelling to Vietnam with my husband and 2 young children (ages 5 and 2) this February. There is one thing I would like to ask you. Besides taking recommended immunizations the CDC recommended, did your family do anything extra to prevent traveler’s diarrhea, and other sickness? Thank you. Hi Lynn, glad this is useful, and that you’ll be going to Vietnam next year. I didn’t take anything extra than the normal vaccinations when I was in Vietnam, and I didn’t have any problems, but you may want to bring along something like imodium just in case. For other sickness, there are plenty of pharmacies there as well. How long will you be in Vietnam? Will you be in Saigon, or traveling to other parts of the country? Hi Mark! Thank you for replying. We will be visiting my in-laws who live in Da Nang for two weeks, and then we will head to Saigon for the 3rd week. I was actually born in the South, near Vinh Long. Have you ever got a chance visit there? It was a nice place, at least in my memory :). This will be my first time (in 25 years) celebrating the lunar New Year (Tet) in Vietnam. I am very excited, but at the same time, I’m worried that we will be sick, especially my young children. I had a bad case of traveler’s diarrhea/(food poisoning?) six years ago when I was there, despite I was being so careful with what I was eating/drinking. ‘Til this day, I still don’t know how I got it. As an adult, I was wiped out. I don’t know how my children would be if they were to get sick. I will pack all the necessary medications and bring lots and lots of hand sanitizer. Again, thank you so much for the post. I am so glad I found this before my trip. I look forward to reading your many upcoming destinations. Hi Lynn, you’re welcome, no I haven’t had a chance to visit the South. I would love to though. Hope you have an amazing upcoming trip, stay safe! Outstanding information thank you Mark, so much to digest, in a sense 🙂 A friend and I are going to Ho Chi Minh in November, so this was very timely. We always watch your videos, no matter the country or topic. Thank you. Thank you very much for the support Steve, and great to hear you’ll be going to Ho Chi Minh City soon. Hope you have a great upcoming trip! Very useful and easy to watch or read!Very good job,Mark! Hi Mark, you’re welcome, glad you like it. If you’re subscribed, it should re-direct you… I’ll look into that. I’ll e-mail you now. Thanks for this great article and beautiful pics!!! You’re welcome, thank you for reading Austin. Thank you for following Andrea.